Bill Everett is without a doubt one of my all-time favorite artists. 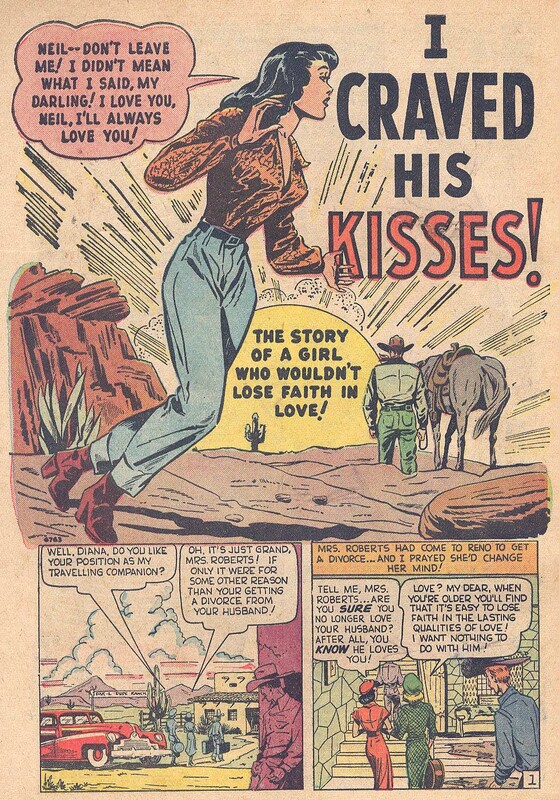 (1) He had a lush, expressive style perfectly suited to comic book storytelling and has long been overlooked as one of the most talented giants of the industry. 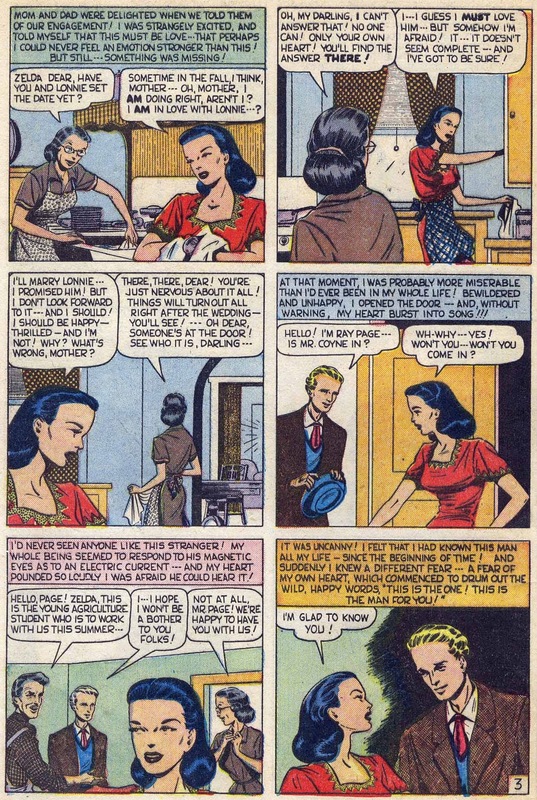 Thankfully, recent light shined upon him by way of a biography and reprints of his 1930's, 1940's and 1950's work will go a long way in re-establishing the artist in history's eyes. 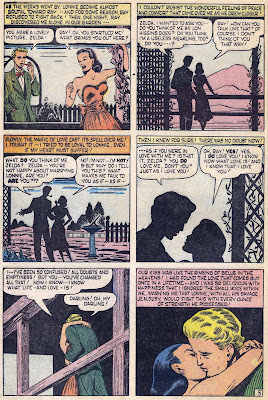 My plan is to touch eventually on all corners of his career but I'm going to start today with an aspect few have rarely seen, his Romance work for Timely/Atlas. 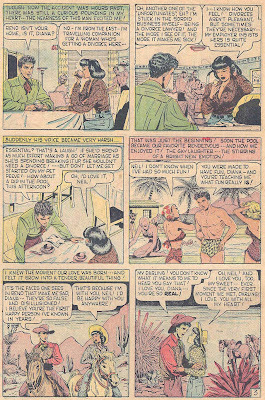 By 1947, Bill Everett returned to Timely as a freelancer drawing his Sub-Mariner once again as well as Namora in the waning hero titles. 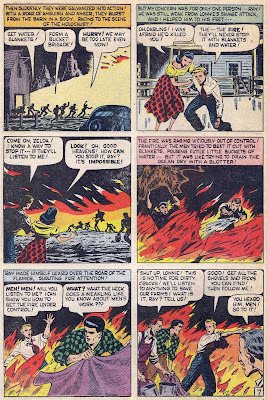 When these finally passed he moved right over into the nascent horror titles, one of the earliest being "Spectacles of Doom!" 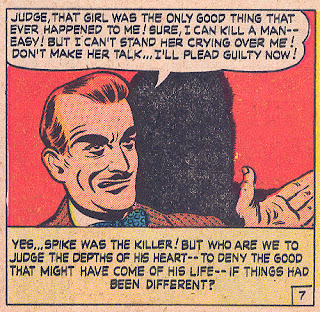 in Marvel Tales #94 (Nov/49). 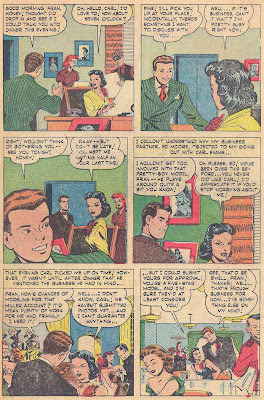 As romance comics flooded the newsstands during the glut of 1949-1950, Everett would join just about "everyone" else in helping to fill these titles with story art. 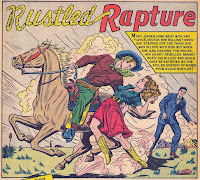 From 1949 to 1957, he would draw 21 stories and contribute to about 5 covers. 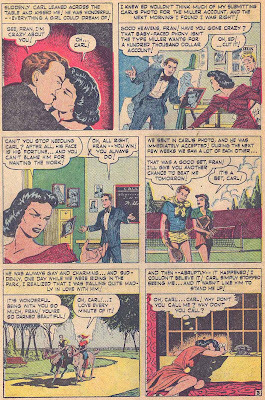 The bulk of the romance work was done for Atlas in late 1951 and 1952, following tenures on Marvel Boy and Venus. 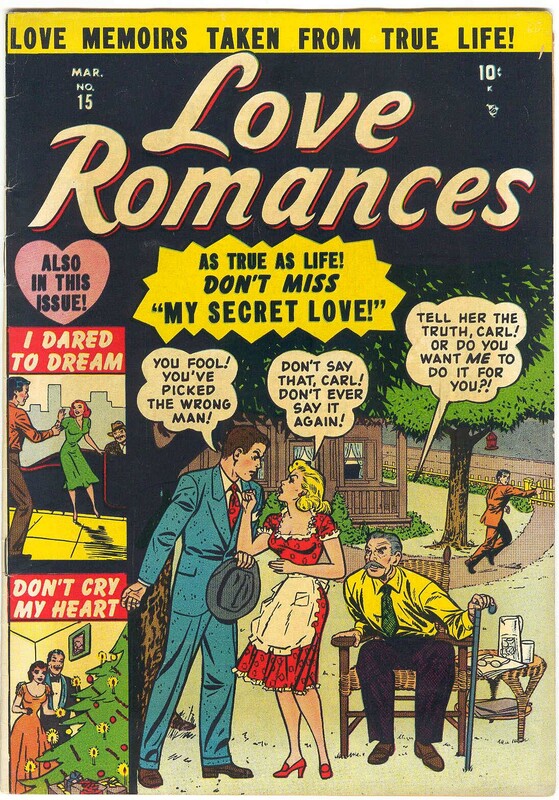 About 2 years ago I completed a collecting task that I'd guess very few people in the world have been able to accomplish, that is, track down "every" single romance comic book published by Martin Goodman between the years 1948 and 1963, a collection of over 500 issues. As the years dragged on trying to accomplish this, I went through every single issue with a fine-toothed comb, indexing the contents and recording creator data into a massive database. 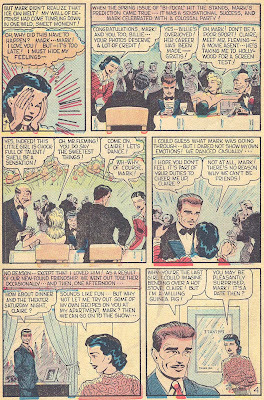 The results were wonderfully surprising as hundreds of unsigned stories were credited properly not only at the initial time of indexing, but in scores of later re-indexing attempts armed with additional years of repeated study of artist styles from a wide variety of sources. I approached this task as seriously as if I was learning a new language. 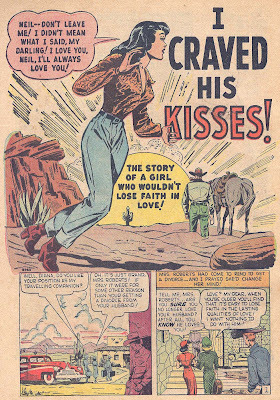 One of the happy results was the below list of heretofore unknown Bill Everett work in a genre mostly ignored. Let's start at the beginning now. At the time of the Timely staff firing, job numbers were jumbled and often printed well out of order. Stories appeared often later in books up to two years after the time the job number would approximately indicate. For this reason, I'll start with "cover date" as we examine the oldest stories. 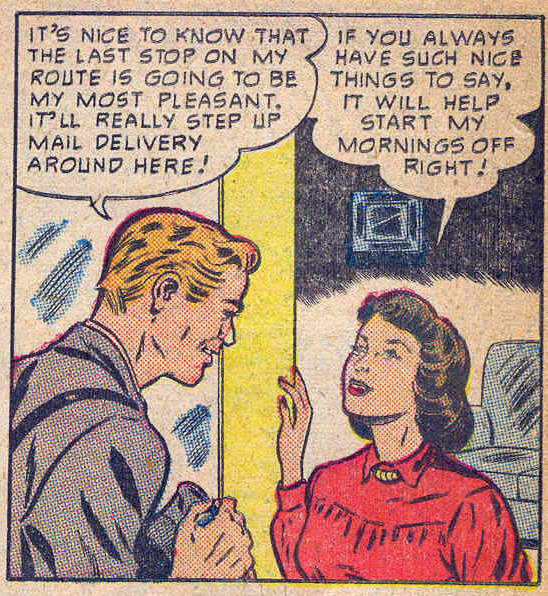 By 1952, the job numbers will match the order of cover date. A) Produced by Timely in 1949. B) Produced immediately after the staff was let go in January 1950 utilizing Timely era scripts. C) Produced by Timely in 1949 but held over as inventory and not published until 1950-51. 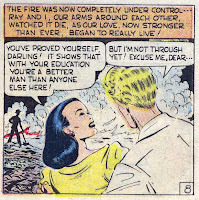 Anything beyond the above will be Atlas romance stories and dealt with in another post. 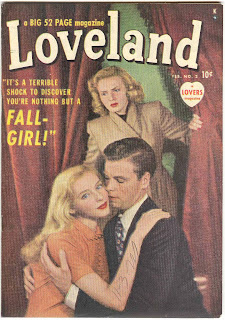 The two earliest Bill Everett romance stories for Timely were both cover dated Jan/50 and on the newsstands in the fall of 1949. 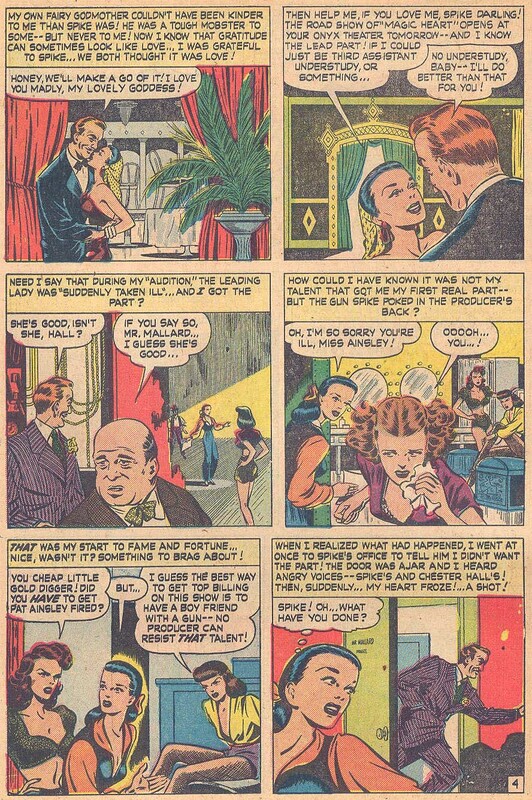 The second story above has additional important historical significance because it was scripted by Natalie Krigstein, the wife of famed artist Bernie Krigstein. Natalie wrote romance scripts from 1949 up through the mid 1950's all around the industry, having been given her start by Stan Lee in 1949 (2). 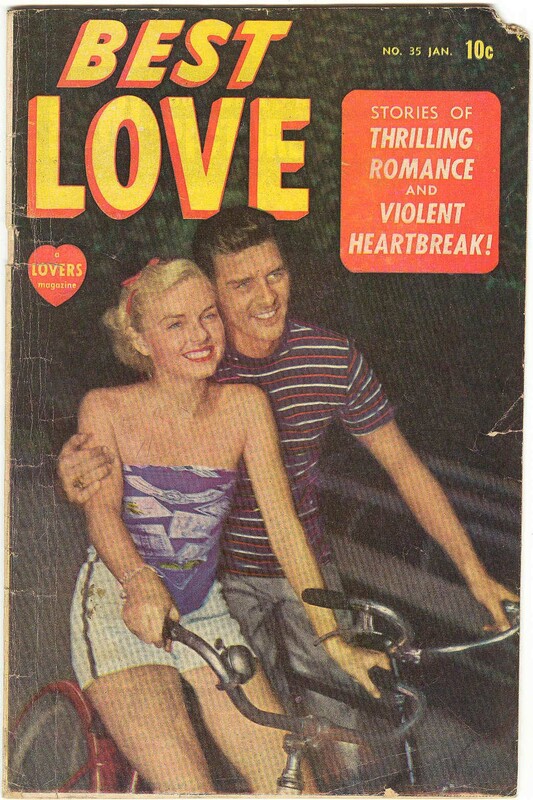 This is one of two of her Timely romance scripts I know of. The story titles of both were given to me by historian Robin Snyder as he had access to some of Natalie Krigstein records (3). 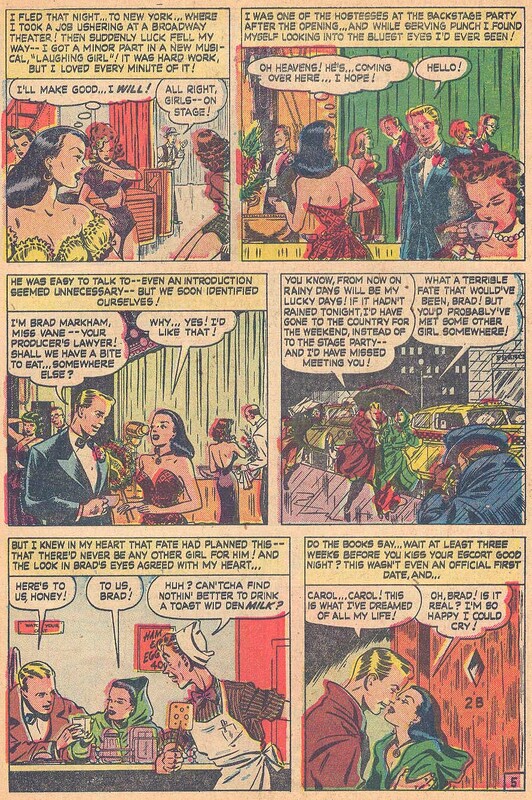 I immediately was able to link them to published stories and in what titles/issues they appeared. 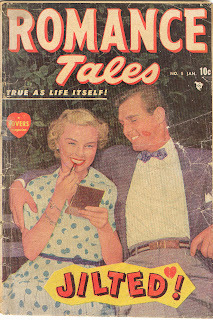 Romance Tales was a three issue run appearing in the midst of the Timely romance glut. While most of these new romance titles started with #1, a handful did not. 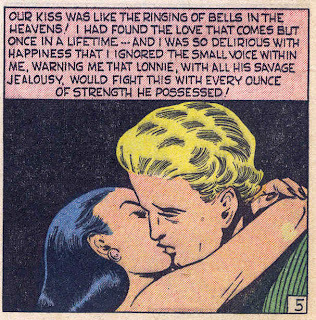 Romance Tales started with #7 and lasted through #9, before cancellation. 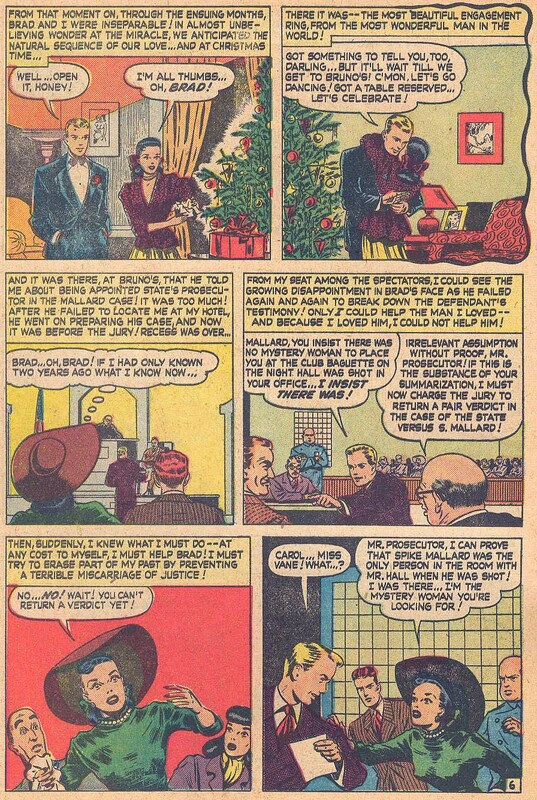 As I showed in my previous blog post on Amazing Detective Cases, there is a reason this title started with #7. Unfortunately, I haven't deciphered it yet. Some postulate Western Winners #6 (Aug/49) as a precursor to Romance Tales #7 (Oct/49) but the fact there is a Western Winners #7 (Dec/49) makes me doubtful. 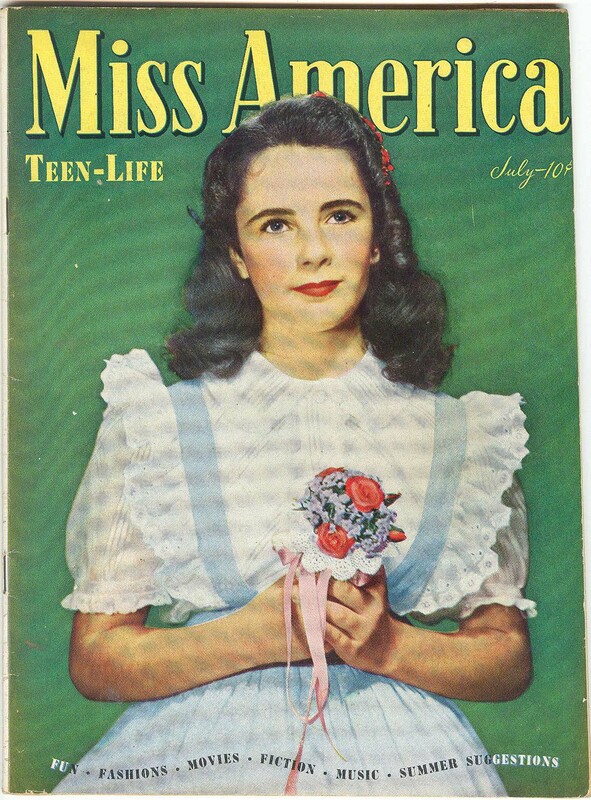 For now, the jury is still out and I'm betting on a magazine connection. 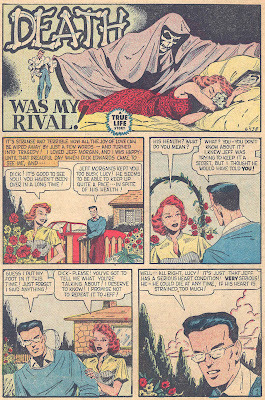 The second Everett romance story this month, the Natalie Krigstein scripted tale, was published in Best Love #35 (Jan/50), a four issue run from #33 to #36, and another title whose numbering continued from the just cancelled Sub-Mariner title, #32. 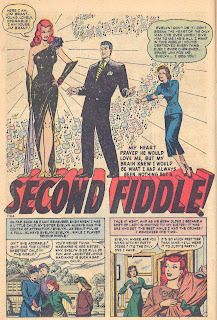 There was also an earlier 1940's Goodman "pulp" with the same title. This particular issue also has stories penciled by Mike Sekowsky and Pete Tumlinson. 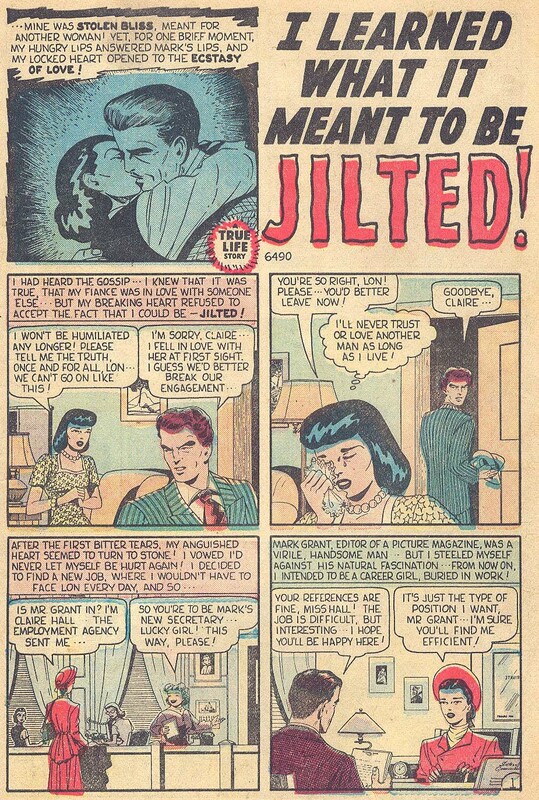 Claire is jilted by her fiance`, Lon, who falls for another gal, ending their engagement. 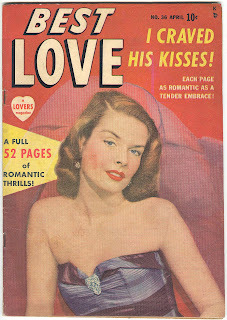 Claire vows to never love again, changes jobs and goes to work for a handsome new boss, Mark, who runs a photo magazine. Enter a beautiful model, Billie, who makes a play for Mark and add in an "accidental" kiss of Claire by the Mark in a darkroom (thinking it was Billie), and now the emotional turbulence starts! 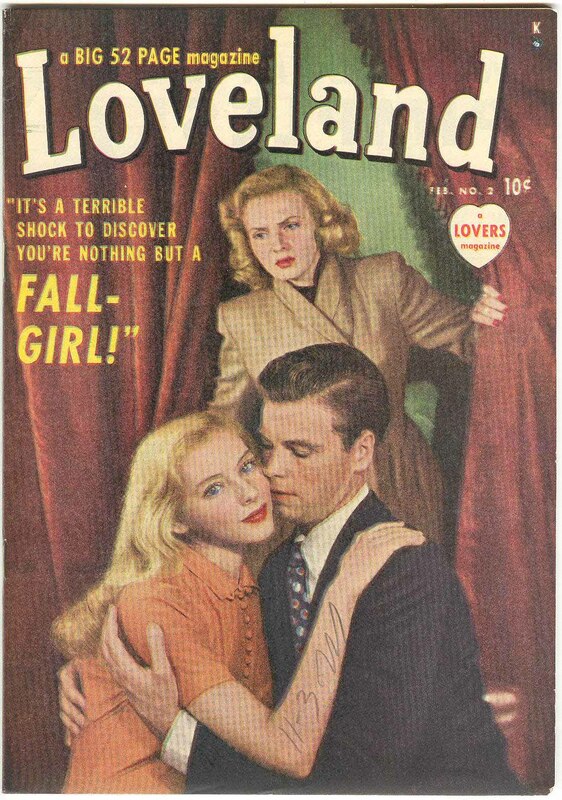 Claire starts to fall for Mark, while resenting Billie, Mark has his eyes on Claire, who still won't thaw her heart since she was jilted by Lon. 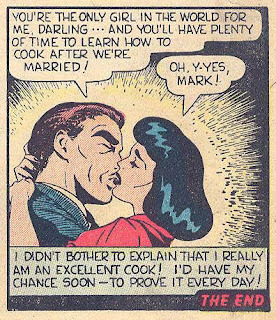 Billie then goes to Hollywood allowing Claire and Mark to start platonic dating. 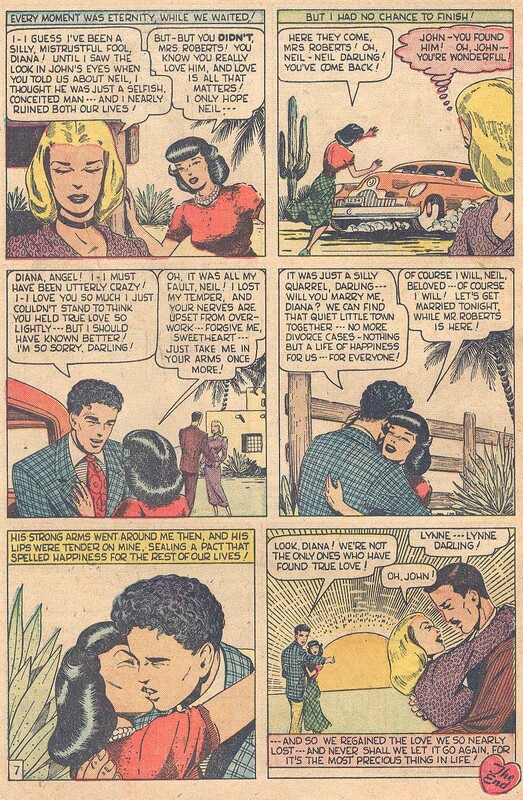 Out of the blue Lon shows up asking Claire to take him back, Claire refuses and professes her love to Mark. 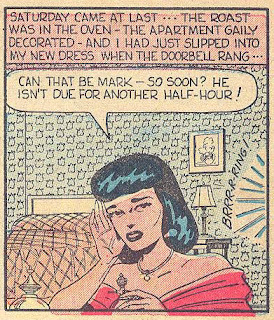 Then Billie returns from Hollywood and tells Claire that Mark has been phoning her every day and begging her to return to him. 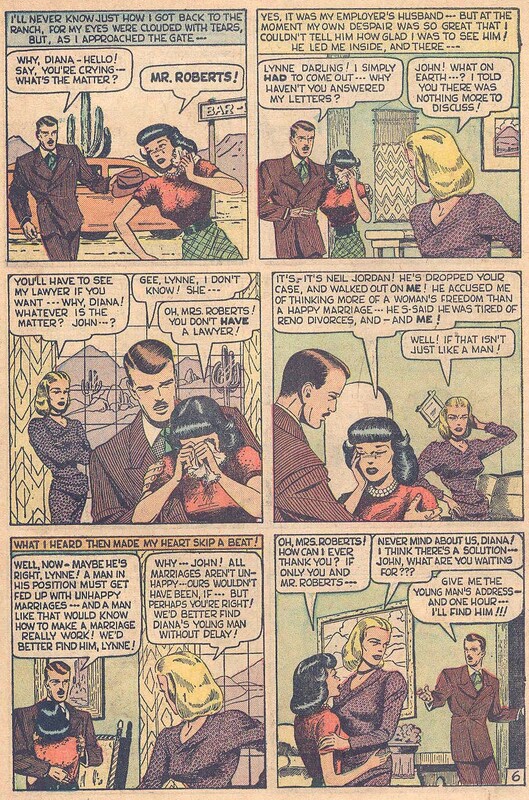 Claire quits, heartbroken again, returns home and calls Lon, but when he arrives she realizes it's still over between them. 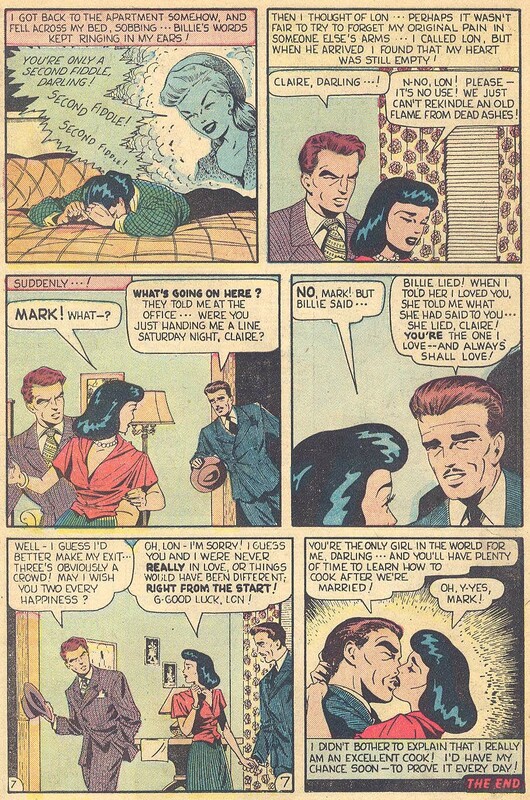 Just then, Mark bursts in and wants to know why Claire left, telling her that Billie was lying all along and they fall into an embrace as poor old Lon realizes he'd better leave. Whew! Everett's art is a bit stiffer as there are more talking heads in this story than anything else. 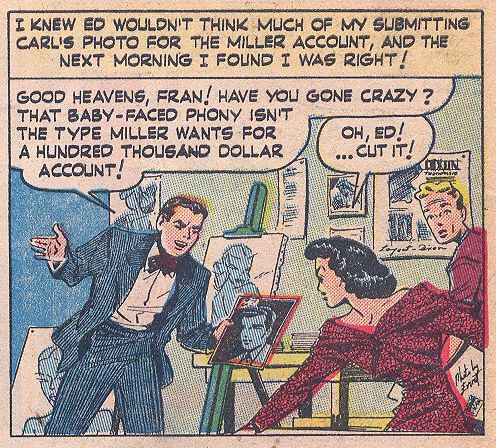 It's still beautiful though, and the lettering may be Everett's also. This second story has a lot less detail and I suppose I cannot be 100% certain this second story is all Everett. 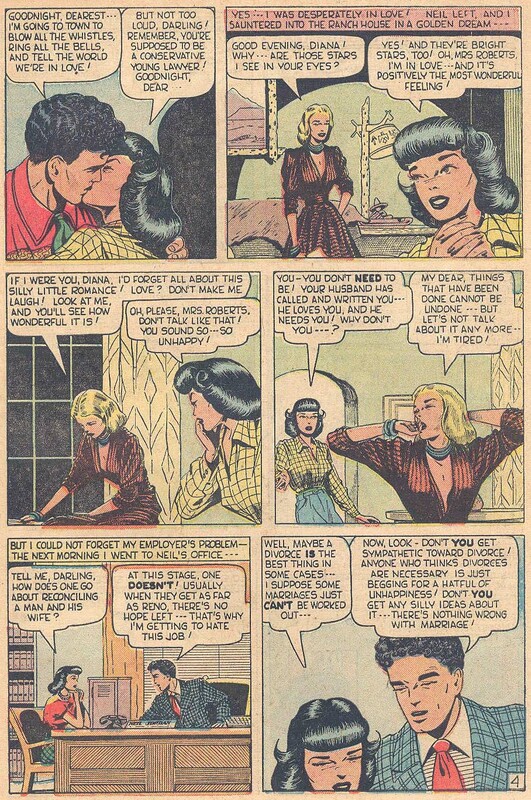 A comparison of the the hair of the females shows the first story has finely detailed hair inking while the second story has almost no detail whatsoever. 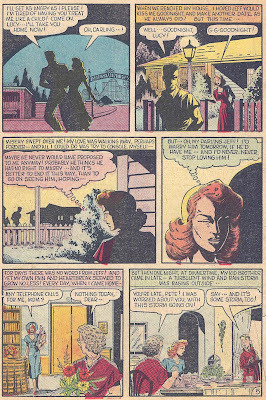 It certainly is within the realm of possibility that there is another pencil artist on this story with Everett supplying a fast inking job. 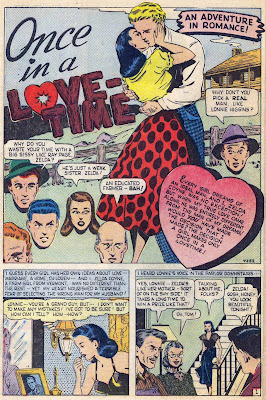 Our third story from this Timely period is in the very next and final issue of Best Love, #36 (Apr/50). 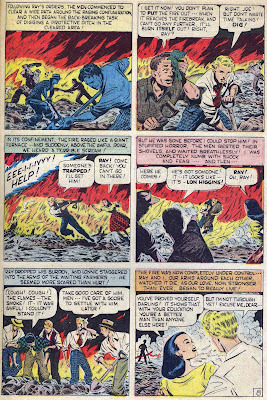 This issue is a Timely/Atlas goldmine as in addition to the Everett story below, you will find splash panels to the other stories by a trio of Atlas titans, Syd Shores, Mike Sekowsky and even Joe Maneely, who drew the splash panel "only" to a story penciled by Gene Colan! I don't want to give too much away because I plan to do a blog post about Best Love in the future where I will highlight all these artists. 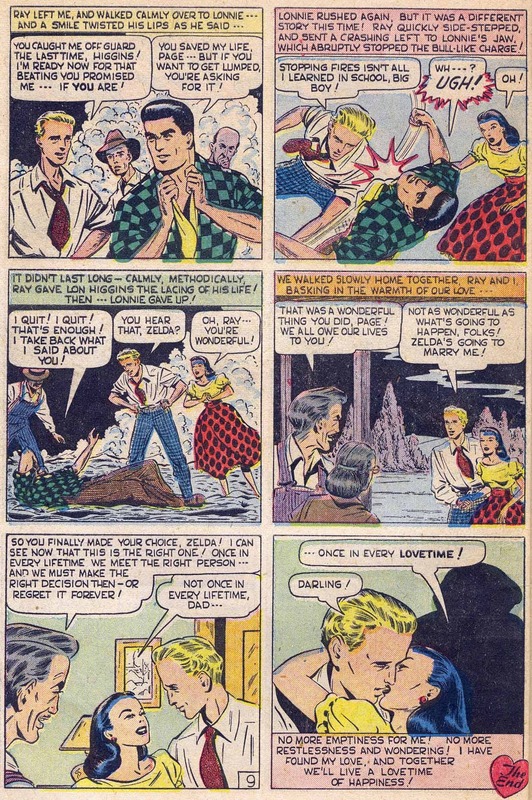 What's immediately noticeable above is that the splash panel is "not" by Bill Everett, instead a generic splash by a generic Timely staff artist. 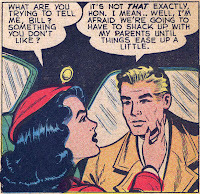 As I mentioned, this was a company policy for a short time in late 1949, early 1950. 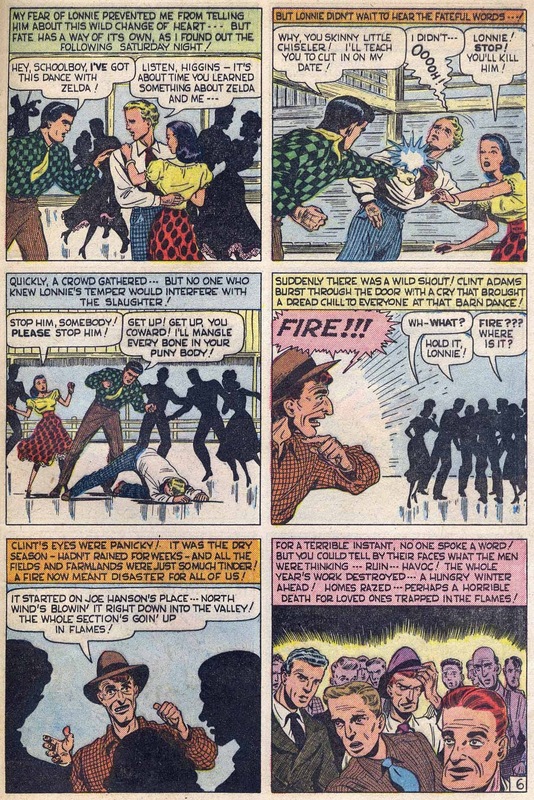 An artist would get a script and staff artists would start every story with a splash, possibly directed by an editor. 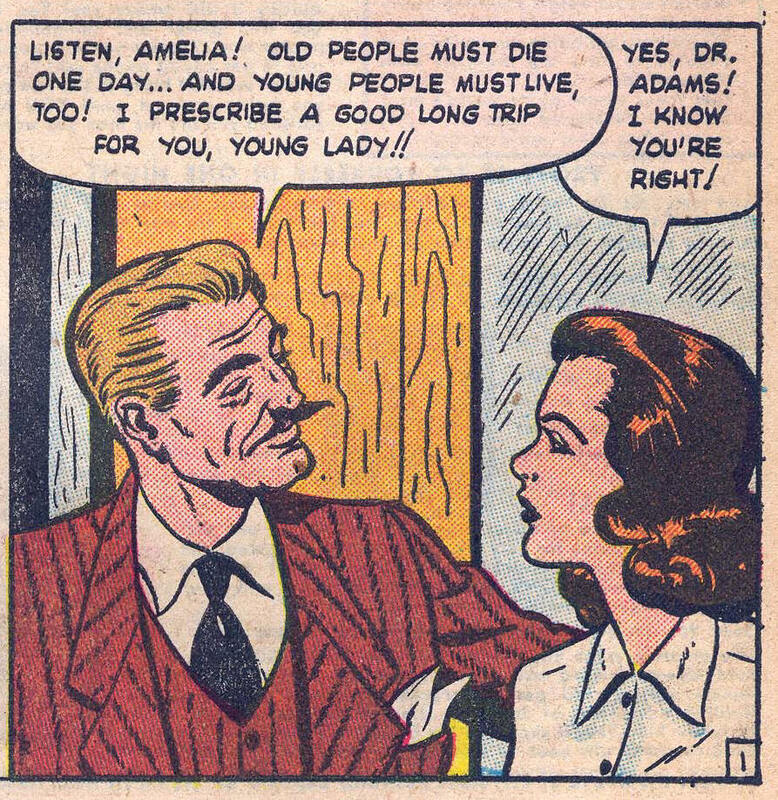 The story artist would then pencil the rest of the story. The whole idea seems kind of silly to me. 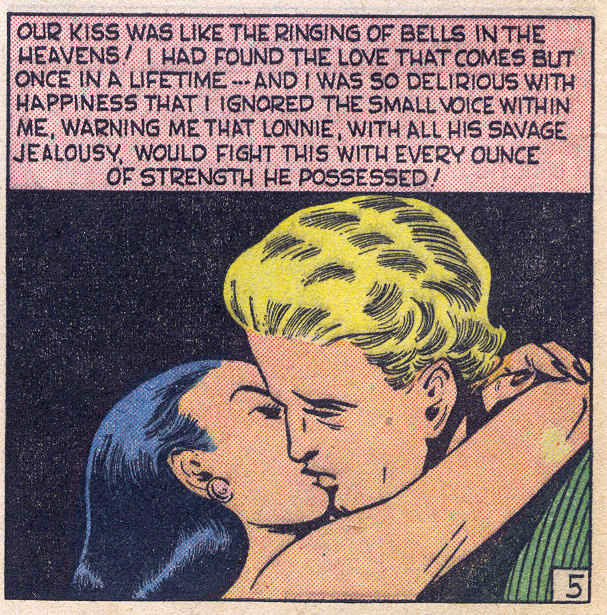 This particular issue, #36, is rife with this. 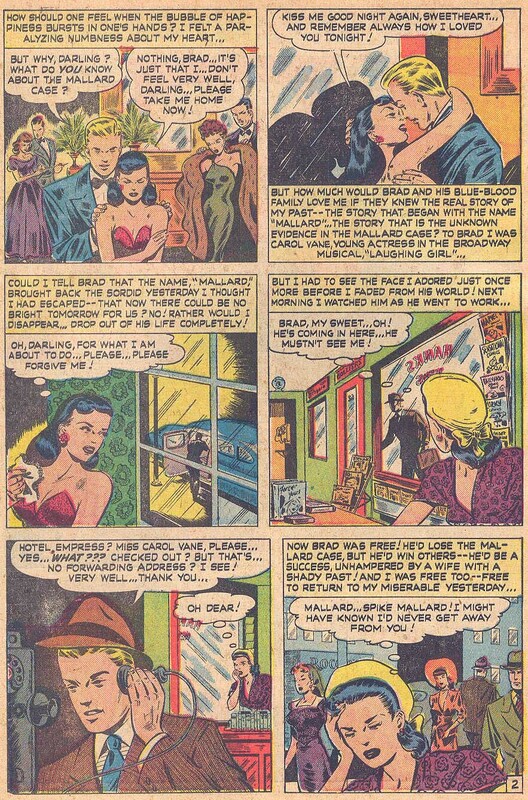 The 1st story is completely unknown to me. 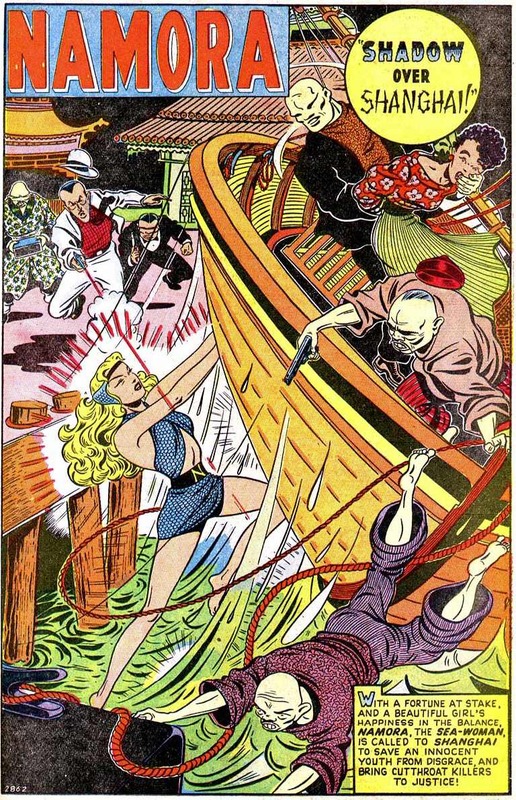 Syd Shores draws the splash for the 2nd story and an unidentified artist draws the actual story. 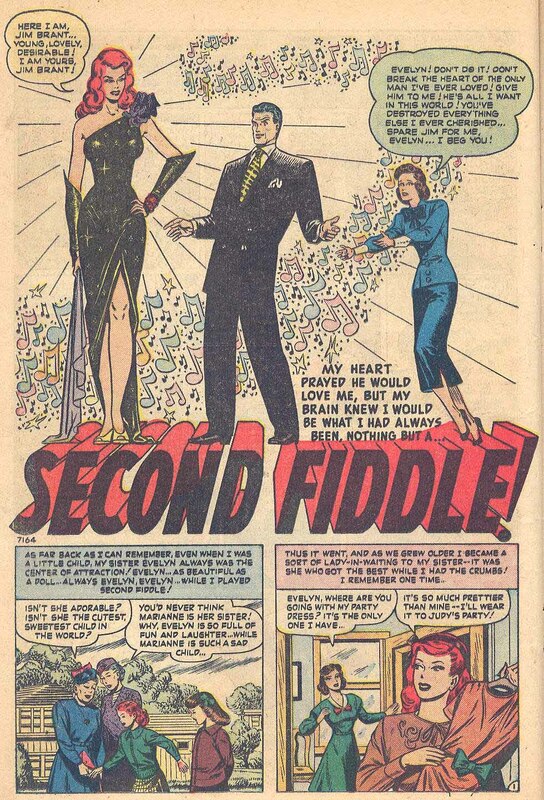 Mike Sekowsky draws the splash for the 3rd story and another artist draws the actual story. 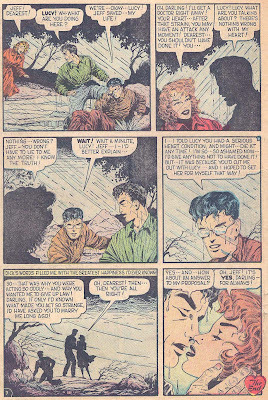 Joe Maneely draws the splash for the 4th story (some of the earliest Timely work in his career) and Gene Colan pencils the actual story. 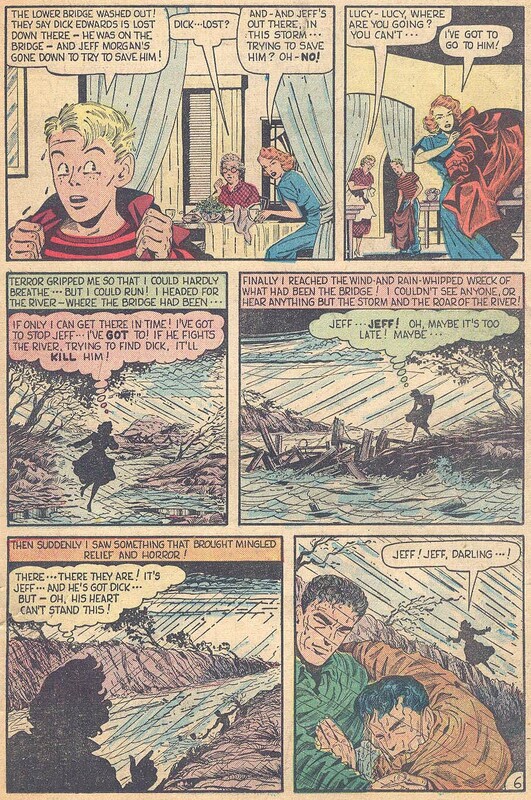 Finally, an unknown artist draws the splash for the 5th story and Bill Everett draws the actual story. 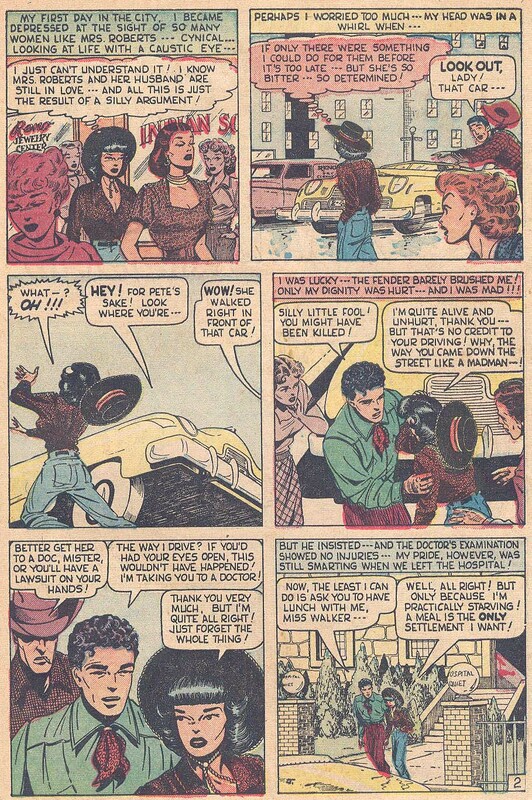 Here are the rest of the pages. Probable pencils, definitely inks and perhaps lettering by Everett once again. 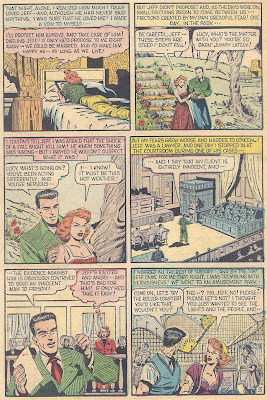 The story is another primer on "true love conquers all" and while heart-warming, a bit dated and idealistic in its depictions of relationships. Everett's art is again sweetly beautiful in a simplistic manner. His young ladies are so darn cute! 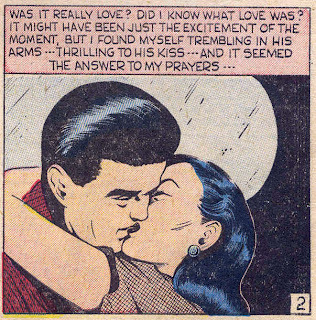 Very little action is shown other than the obligatory lover's clinch. 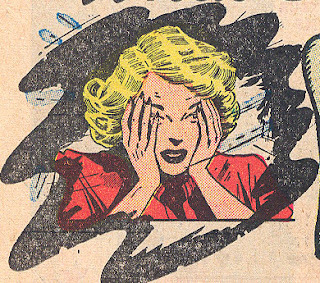 Our next story has quite possibly never been seen, primarily because it's found in what may be the scarcest Timely/Atlas comic I know, Girl Comics #3. 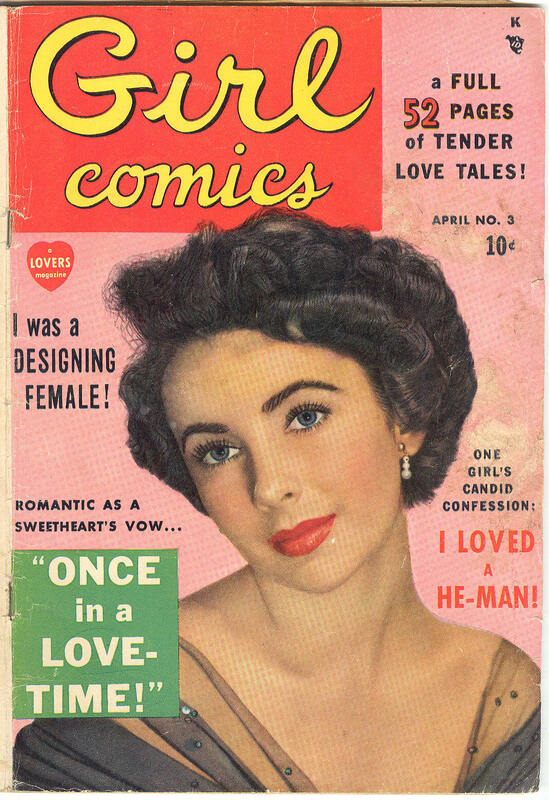 I don't completely understand why Girl Comics #3 is so scarce and in such demand but a possible reason is that then child film star Elizabeth Taylor is featured prominently on the cover in a scene from the MGM film The Conspirators . Since the fetching Miss Taylor was featured prominently on hundreds of movie magazine covers at this time, including an early issue of Goodman's Miss America Magazine, Vol 4, #3 (July/46) [seen below], as well as the second to last issue of Goodman's spin-off Miss America Young Life magazine, Vol 1, #2 (Winter/49), it seemingly makes no sense why this one is so sought after. 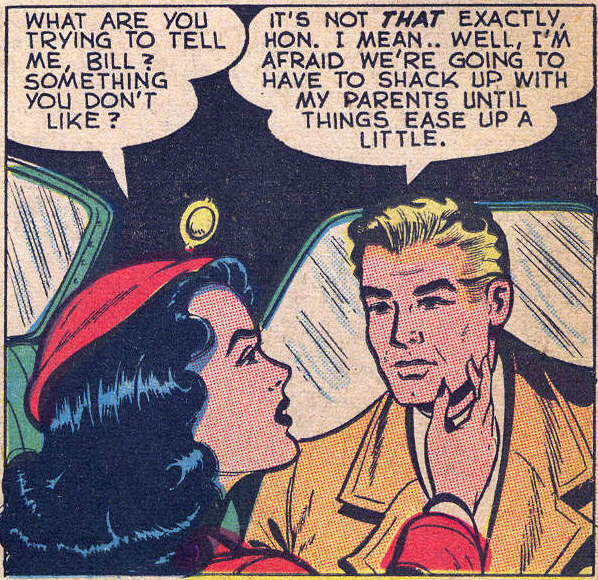 It's not because of the Bill Everett story. Why Girl Comics #3 should be special continues to amaze. 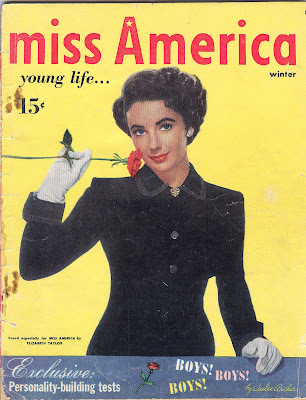 There has been no bump in price on the other Elizabeth Taylor covers I mentioned above. Copies of #3 do come up for sale but often sell for 10 times more than any concurrent Timely romance issue, usually not bought by a romance collector, but by someone hoping to acquire a perceived trophy. 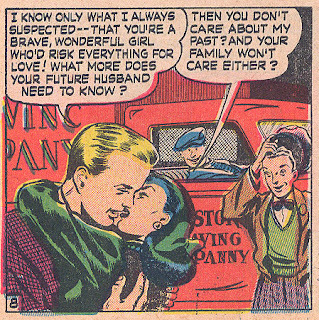 I sincerely doubt it's actually any scarcer than #2 or #4 and I wish "trophy" collectors would just eave them for the romance collectors. 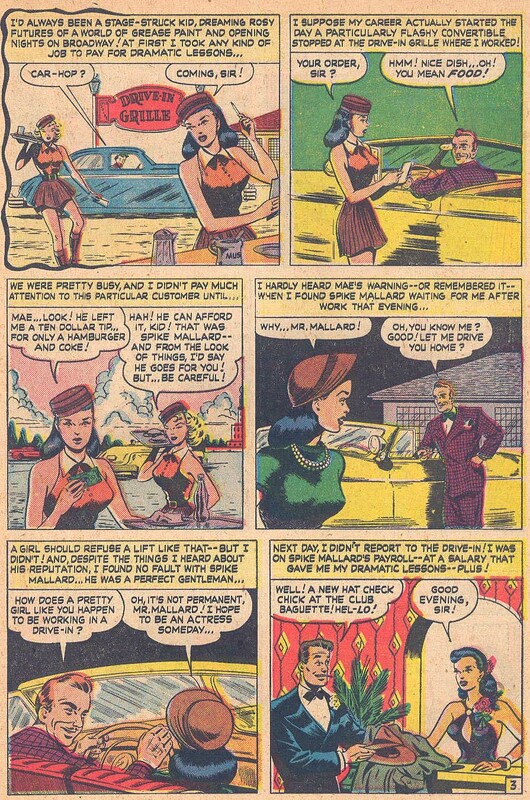 Girl Comics was a neat little run of 12 issues. 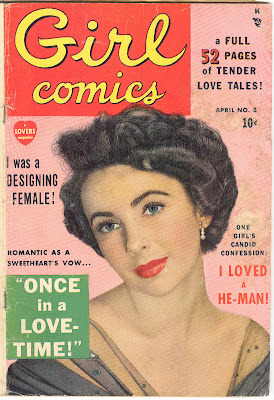 The first 4 issues were standard romance fare with photo covers. 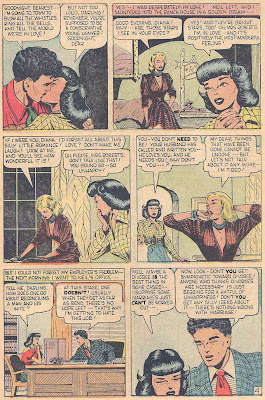 By #4 it changed slightly to adventure type intrigue stories featuring women and then changed title to Girl Confessions, a strict romance title, up through #35 (Aug/54). 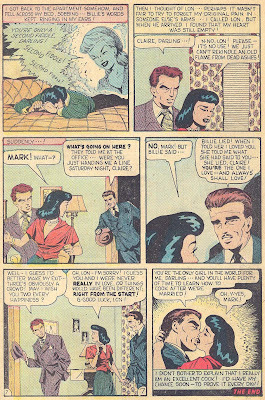 Artists in the first 5 issues include John Buscema, Mike Sekowsky, Gene Colan, Joe Maneely, Bill Everett, Werner Roth and Russ Heath. 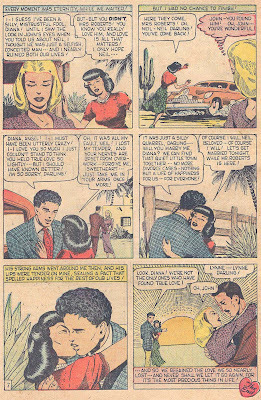 The Everett story here is the extra long 9-pager "Once in a Love-Time", #7252, but I don't believe he lettered this one. 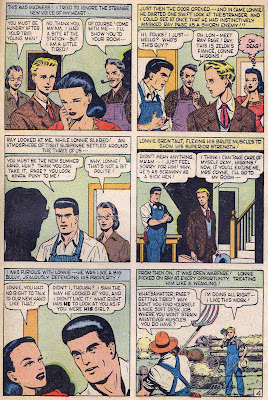 Everett usually drew his own word balloons and they are somewhat evident in the first 3 stories above. 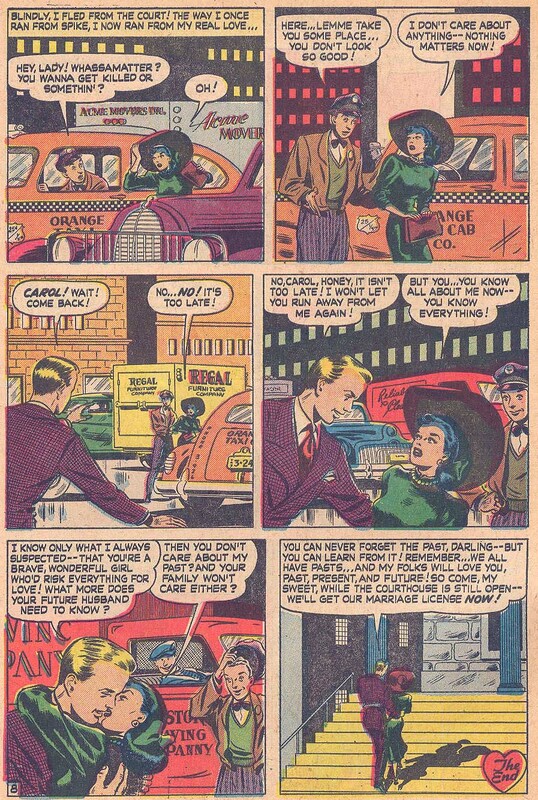 These word balloons are of standard Timely design as is seemingly the lettering, which appears just slightly smaller in font size. I'm curious as to whether others agree. The artwork is slick and beautiful, the story intense and formulaic. But another problem arises. 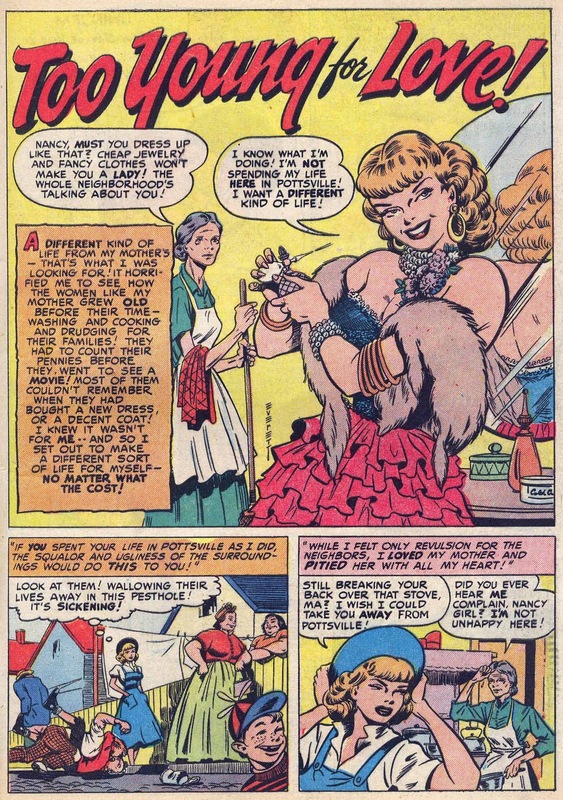 I've studied this story inside out and I'm starting to think, yet again, someone else is penciling this. Since Everett is such an overwhelmingly stylistic artist, when inking, it's very hard to see "anyone" on a story except Everett. 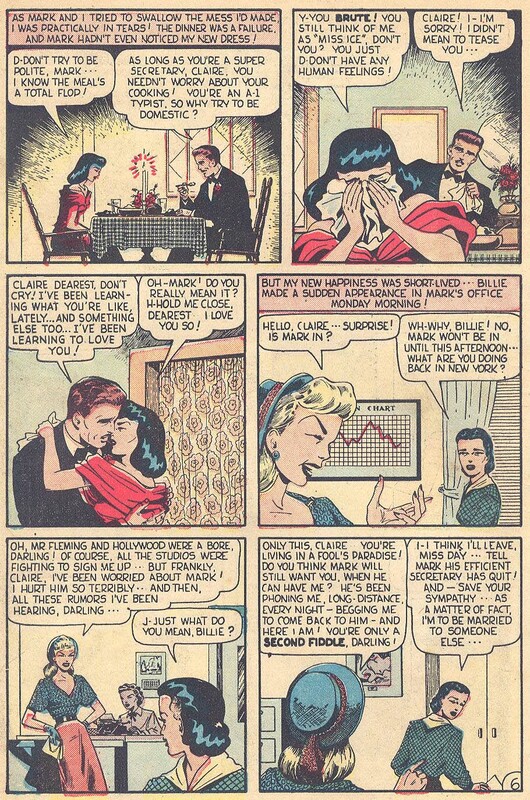 You have to go by the actual figures in the panels. Everett is a veteran of exciting storytelling. 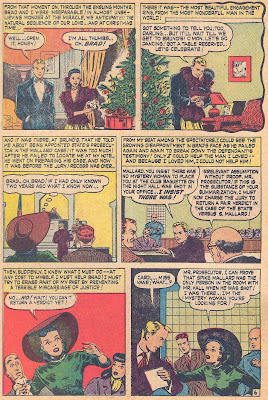 The first Timely story above has many exciting, riveting panels that imply Everett penciled as well as inked. 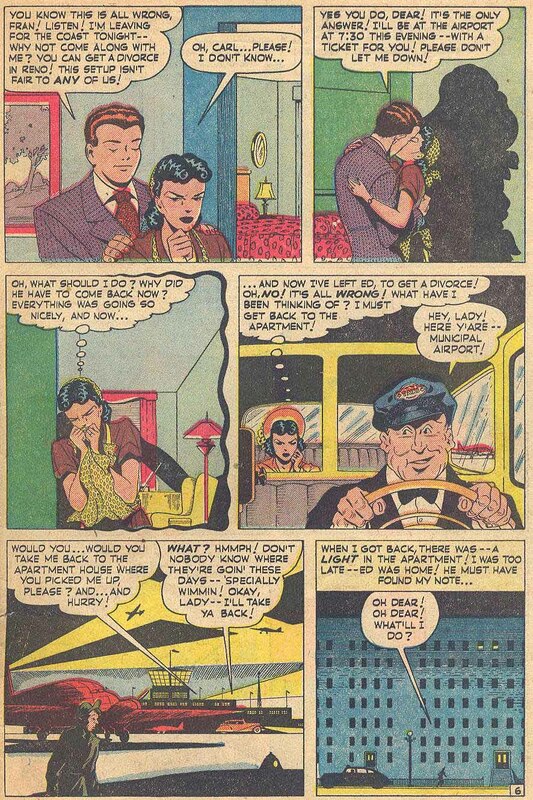 This Girl's Comics #3 story, once again, is nothing but talking heads slickly inked by Everett. 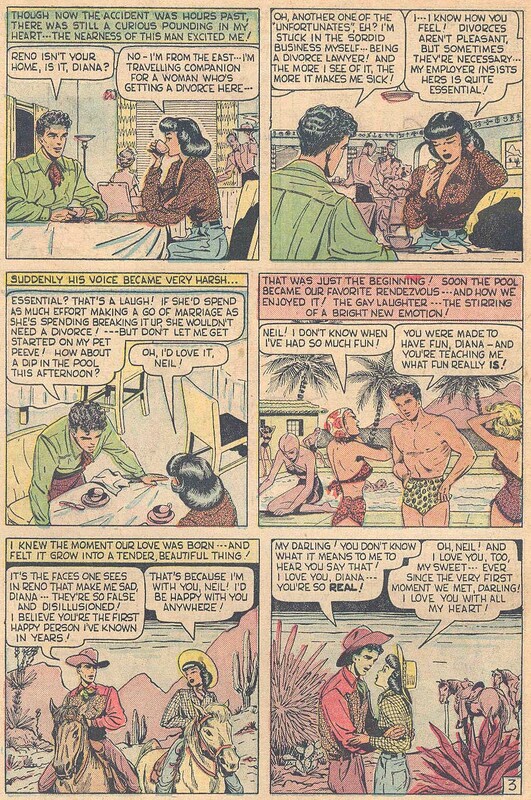 Further, a close examination of all the heads and faces, especially on the females (including their head positions), leads me to wonder if the hidden pencil artist under all of the Everett inking is in fact Timely staff artist Marion Sitton, a veteran of 10 Timely romance stories that I have identified (and untold others still not uncovered). 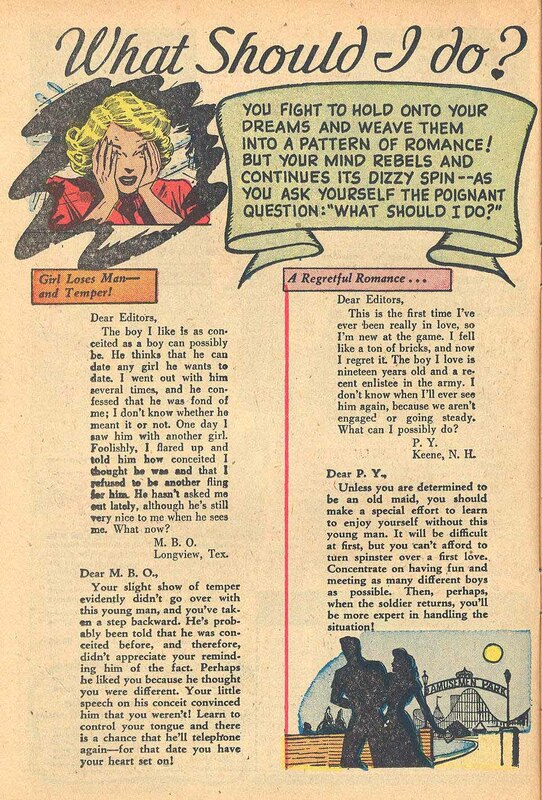 I covered Marion in a series of blog posts in December of 2010 and one post actually addressed his pencils for Timely romance stories. 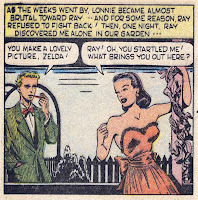 Sitton Timely romance. 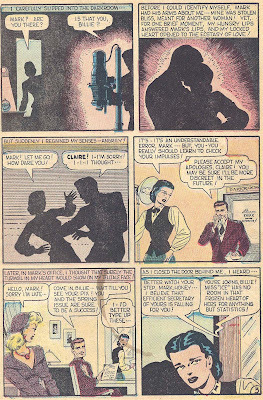 Unfortunately these are mostly splash panels but look them over, and understanding that he only penciled them, get a feel for his figure work and then look over this Everett story again trying to ignore the Everett inking (very hard to do!). It's only a suggestion on my part but I'm curious what other eyes see. 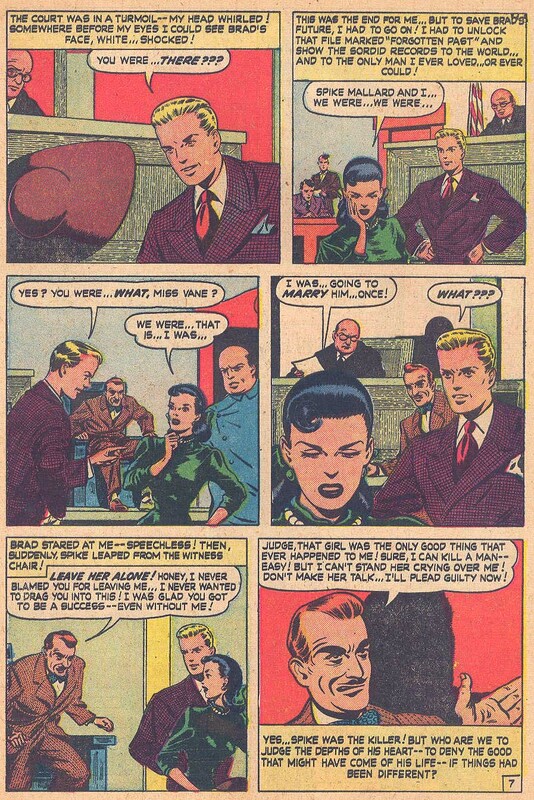 Sorry about the haphazard appearance of the Sitton panels above. I tried to arrange them in groups of 2 and 3 for easy viewing and blogger makes it extremely hard to do so. Either that or I just don't know how to easily do it. "Michael, I looked at the story that you sent in Girl Comics #3 that Bill Everett worked on and I'm pretty sure that I may have done the penciling on this one. 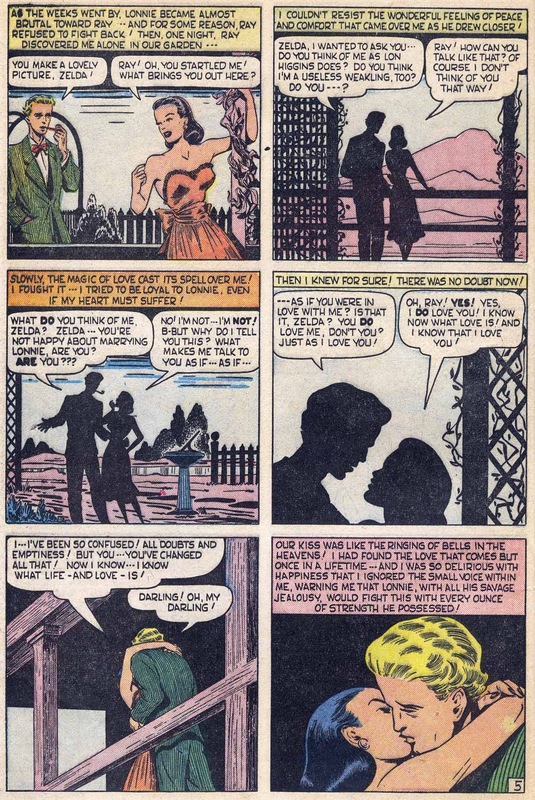 The figures, the actions and the composition of the panels (always full), was the way I worked. Overall, it looks like my penciling. You have a sharp eye!" 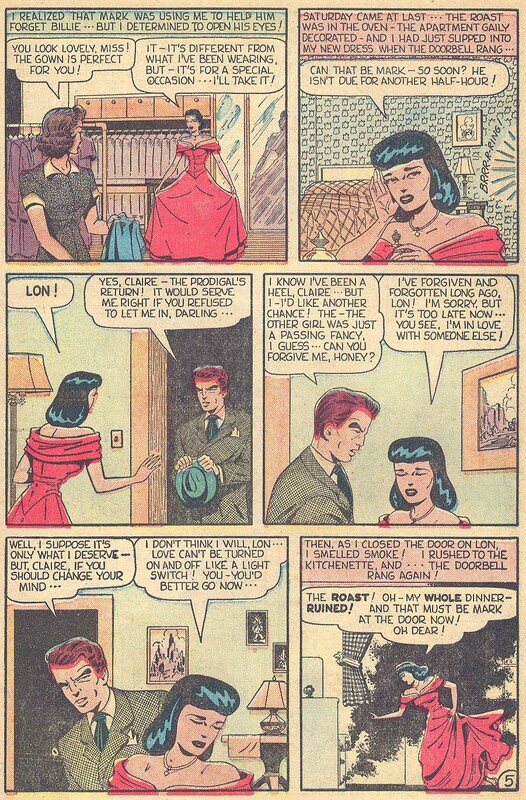 Does this prove Marion was the pencil artist? 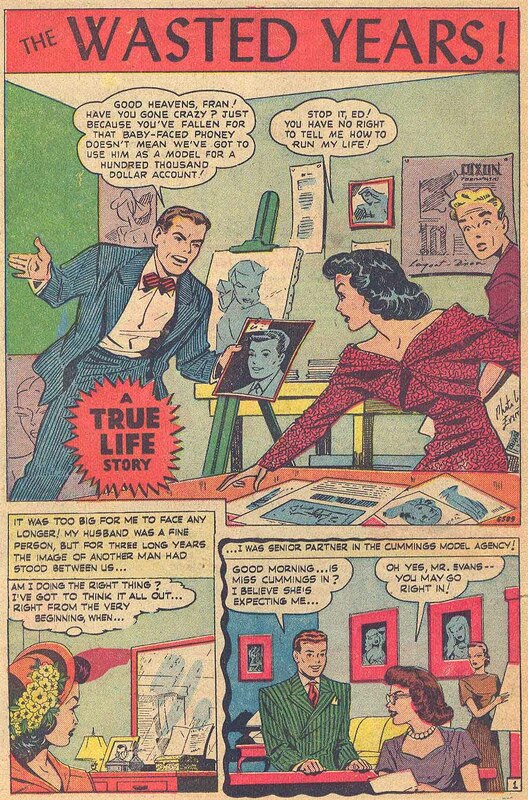 No, but it is one more step in the investigative process as we consider the stylistic differences between pencil and ink artists and run it by who was there at the time and could be possible suspects. 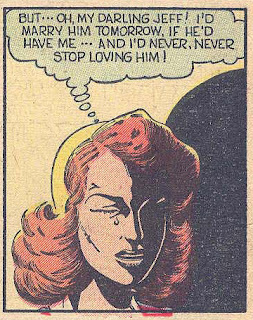 The next story is a bit of an enigma. The job number of #6589 places the script back into the late 1949 Timely bullpen. 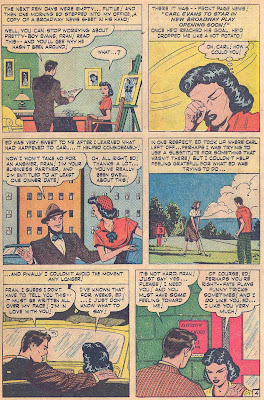 The story though, was published in True Secrets #6 (June/51), just before the appearance of the Atlas globe in the post staff period. 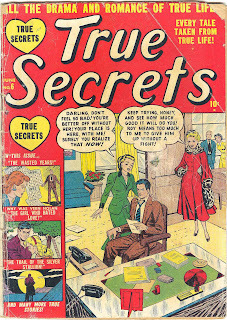 True Secrets was an odd little title. 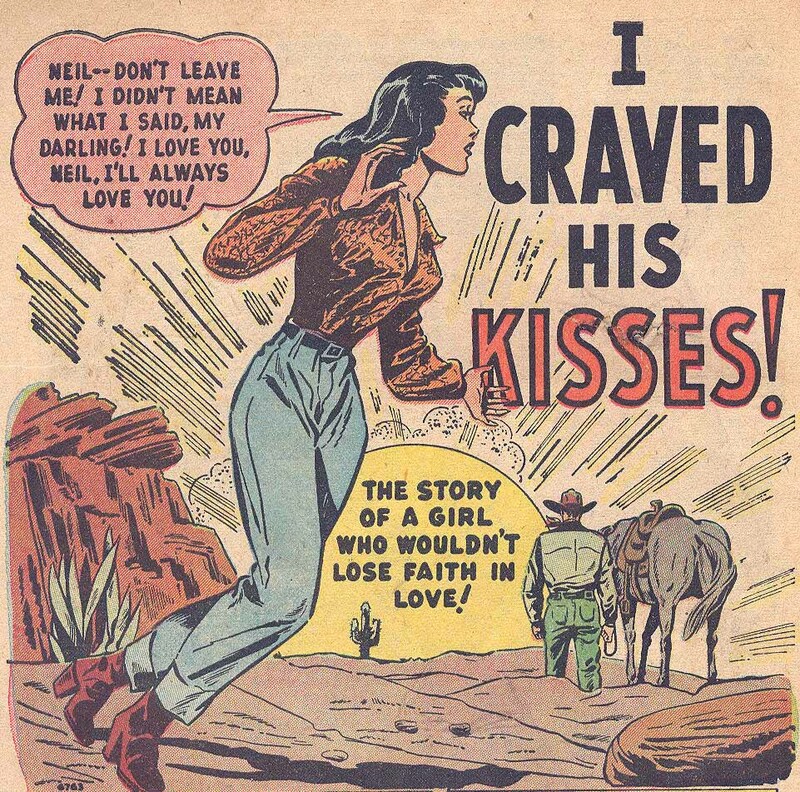 It began with #3 (Mar/50) as a possible continuation of the short-lived Our Love #1-2, where it died as a one-shot along with a score of other romance titles canceled in the romance glut of 1949-50. But lo and behold, it continued again 11 months later with a 4th issue dated Feb/51, continuing up through #21 (Aug/52), when it was canceled again. Or was it? 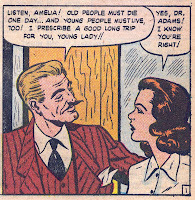 18 months later it continued again with #22 (Feb/54) and it ran until a final death with #40 (Sept/56). 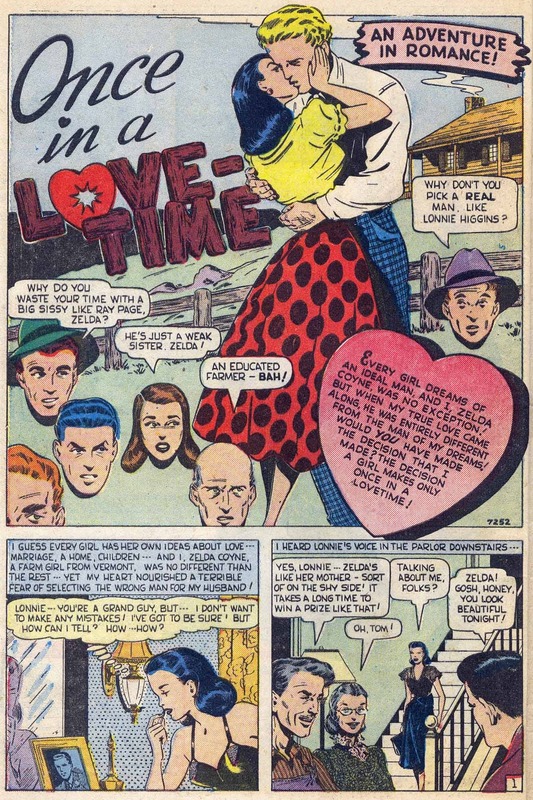 The only other Timely/Atlas romance title with such a stop/start history was Love Tales, which ended with #58 (Aug/52) and then picked up again with #60 (Feb/55), skipping #59 in the process. The first 4 issues of the revived True Secrets, #4-7, all had stories with job #'s from the Timely era of 1949. 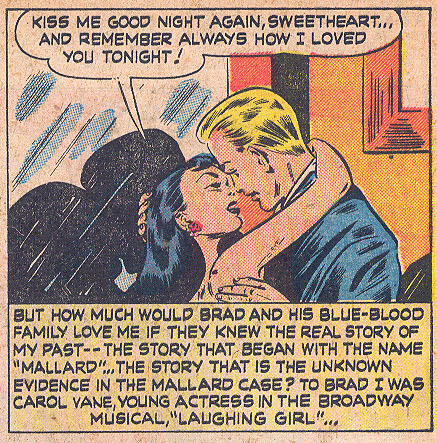 Either these were inventoried stories resulting from the romance glut cancellations or they were old scripts from the same period now newly drawn in 1951. 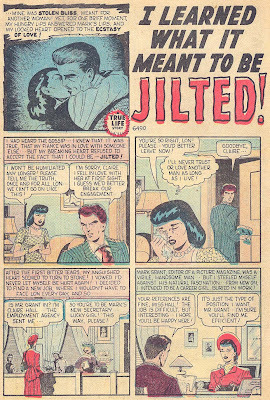 Issue #6 here, in addition to the Bill Everett tale, had a story by Russ Heath also. 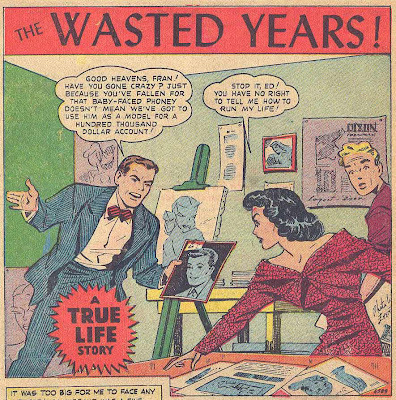 Right away this story, "The Wasted Years", starts off with an anomaly. 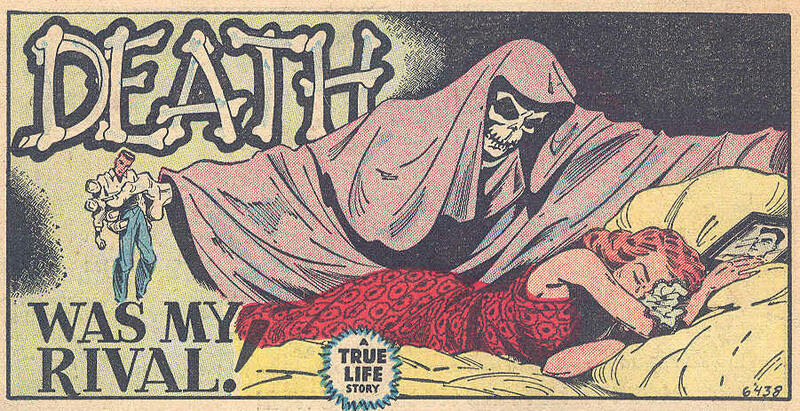 The splash panel is actually page 3, panel 2! 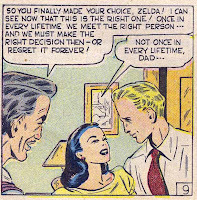 And it doesn't look like the entire work of Bill Everett either, even though the mid-right side has a "Photos by Everett" sneak under the woman's left arm. 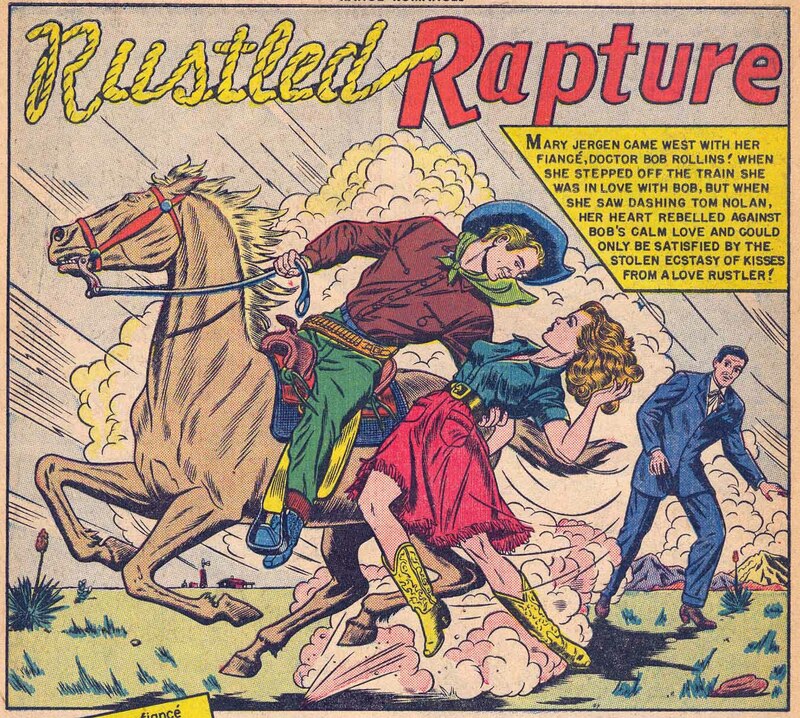 At the very least, this splash almost looks Chris Rule inked. 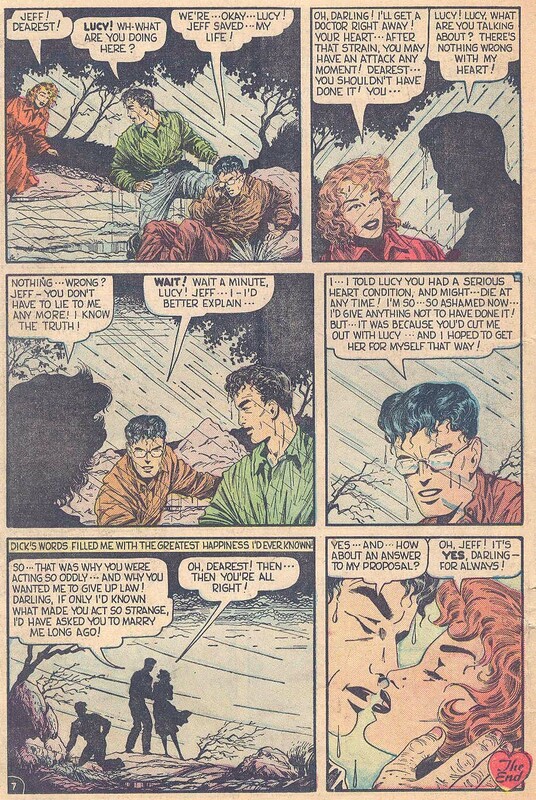 What I think happened was that a splash was needed for this story, perhaps for the same reason many of the 1949-50 stories had splashes by different artists from the main story artist. 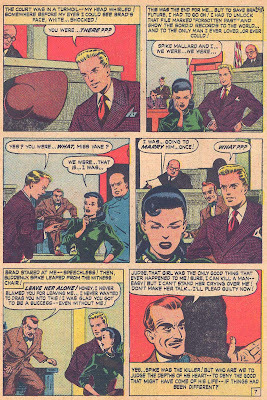 Instead of a new artist drawing a new splash, page 2, panel 3 was chosen as the splash, a panel carrying a lot of climaxed action, and Christopher Rule went over the panel, adding details including drawing the table at the bottom and giving the woman a right hand. 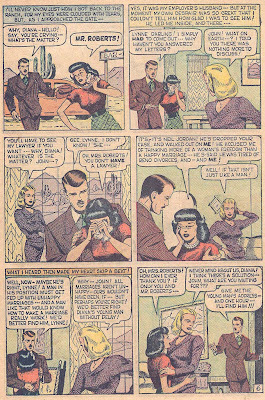 The rest of the story occasionally looks like Everett had another hand in it and Everett's artwork is the least cartooney we've seen it here, the men looking very plain, very un-Everett like, while the woman look purely Everett. For a while I thought I found a clue on the splash. I pointed out the "Photos by Everett" sneak above but if you look at the poster on the wall, you will see "Layout - Dixon" sneak also. The only problem with this is I cannot account for any artist named Dixon. 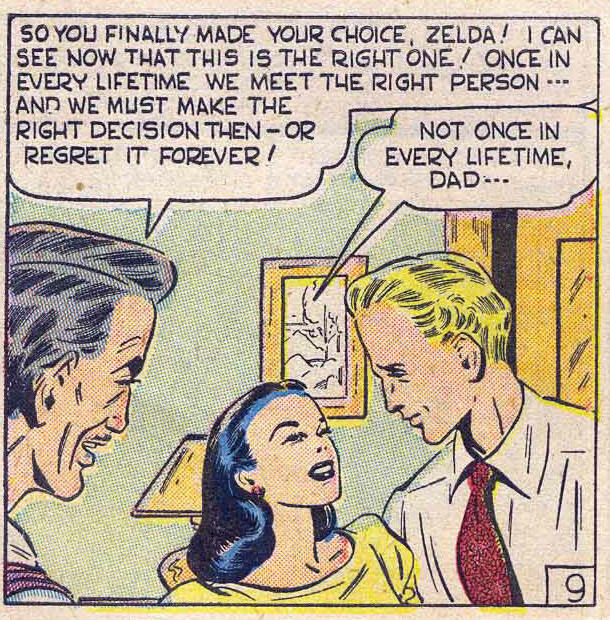 At the end of the story on page 7, we see the classic "Bill Everett" signature, the first time we see it on a romance story. 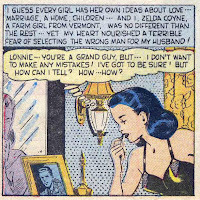 This clinches the story's genesis to 1951 rather than inventory from 1949 and likely also corroborates the story being all Everett. 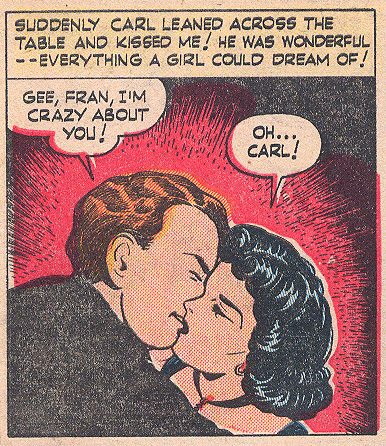 It would seen strange for the inker to sign the story, although not impossible. 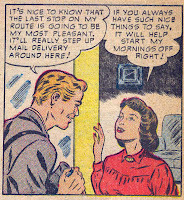 The next job number in series, #6957, appeared three months earlier in Love Romances #15 (Mar/51). The story "Don't Cry, My Heart! 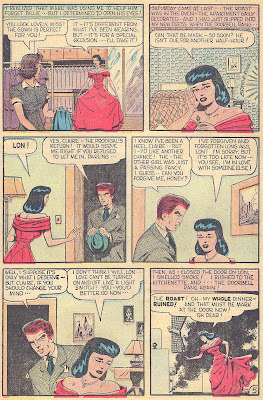 ", lacks Everett's signature and like the previous story in True Secrets #6, likely hails back to early 1950. 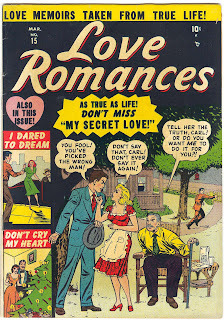 Love Romances was Timely/Atlas/Marvel's longest running romance comic, lasting 102 issues from #5, cover dated March, 1949 (titled Ideal - Love & Romance) through #106, cover dated July, 1963. 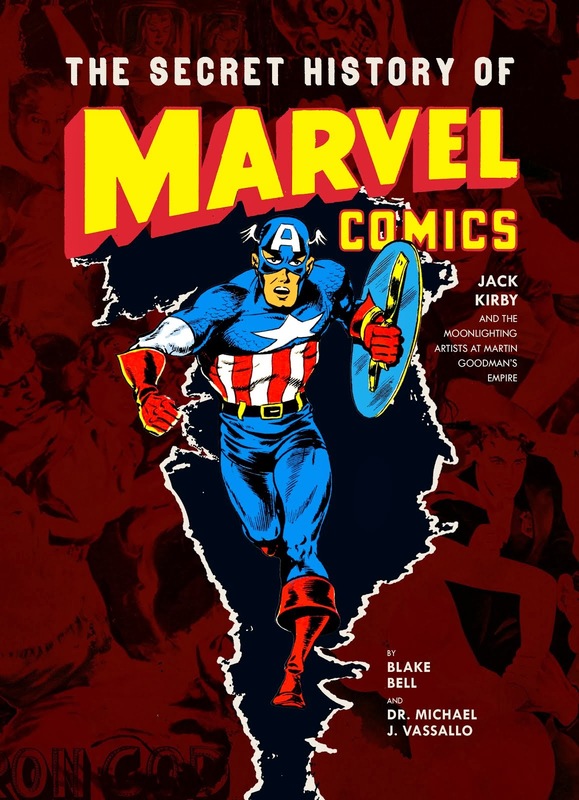 The book spans the length from Timely, through Atlas, past the implosion and into the early Marvel age. The cover to issue #15 above looks to be primarily by Christopher Rule. 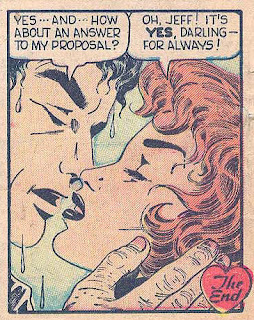 The corner boxes are 100% Rule but the main cover "could" possibly be penciled by someone else, perhaps Mike Sekowsky. 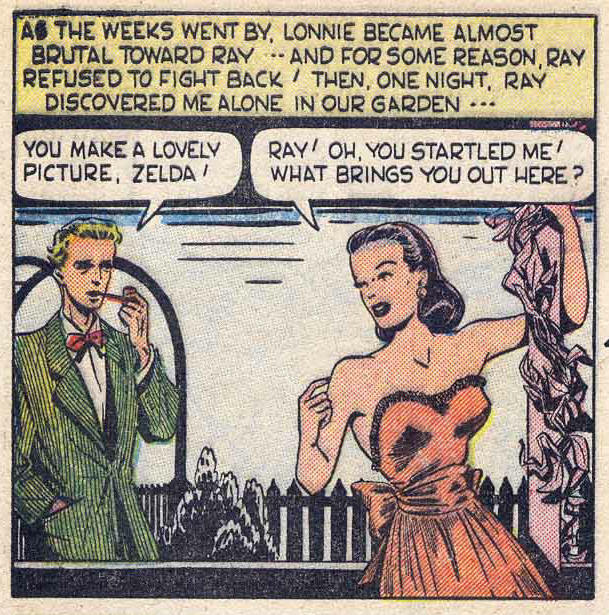 Rule's inks are so overwhelmingly distinctive that it almost impossible to tell who, if anyone, was underneath. 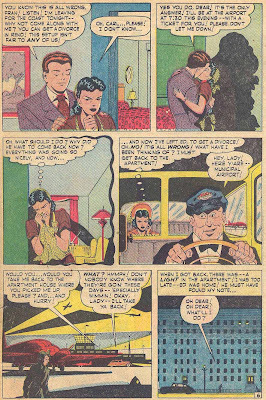 This story poses another "is it all-Everett?" problem to me. 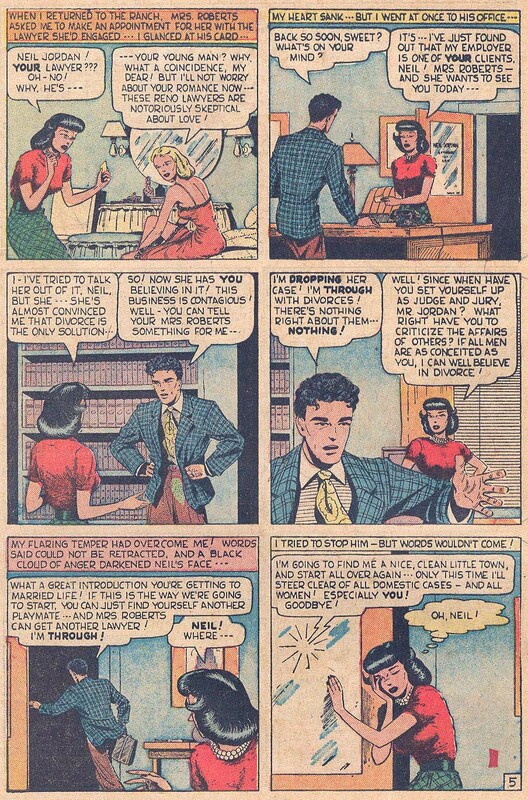 Look at the entire story. 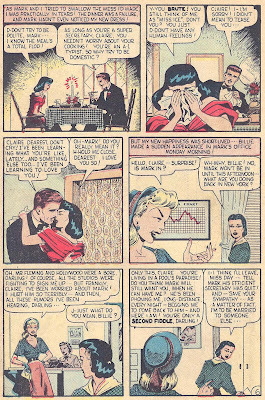 Bill Everett's hand is unmistakable, especially page 7 below. 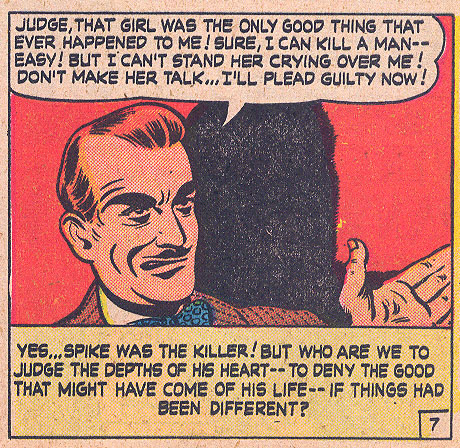 But the rest of the story has a decided feel that there is another hand involved. 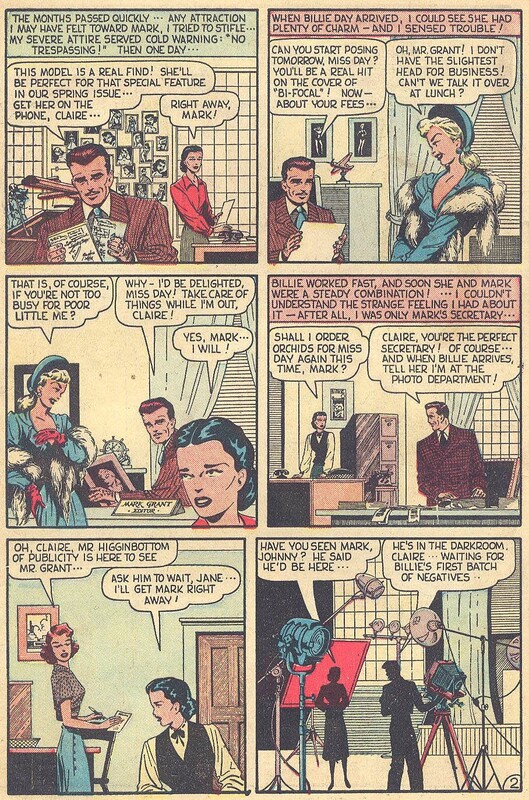 It's either that or Everett (whose work often "did" vary in refinement from story to story in the mid Atlas period) just stripped down the art, penciling and inking in a simplistic manner. I think a more likely scenario is that Everett is inking a penciler once again. 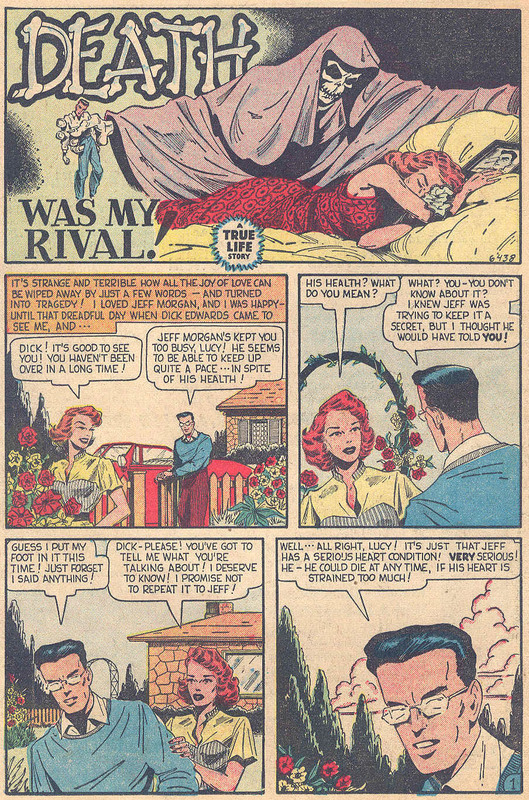 Everett as an inker on a romance story does have corroboration outside of Timely. 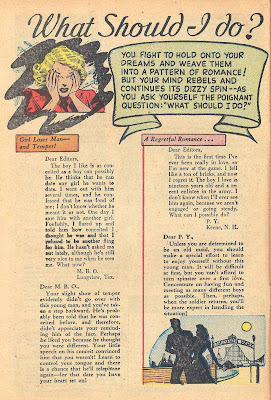 Over in Love Diary #9 (Oct/50), published by Our Publishing, three romance stories have Bill Everett's involvement. 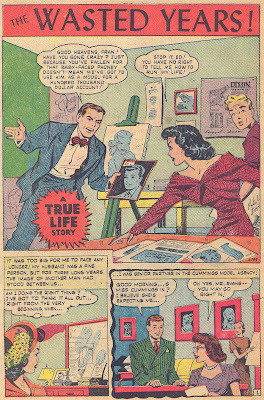 One is completely drawn by him, the second inked over possibly Nina Albright and a third story possibly with Al Camy. 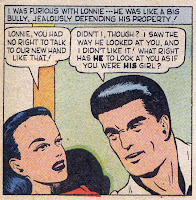 Page one above in our Love Romances #15 story has a splash panel where the blond man on the right side, if I didn't know better, I would swear was drawn by Joe Maneely and then inked over by Everett. 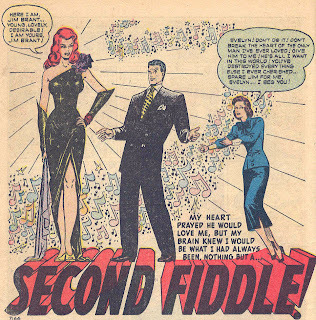 That, of course, makes no sense, Maneely only penciling a single figure in a splash. 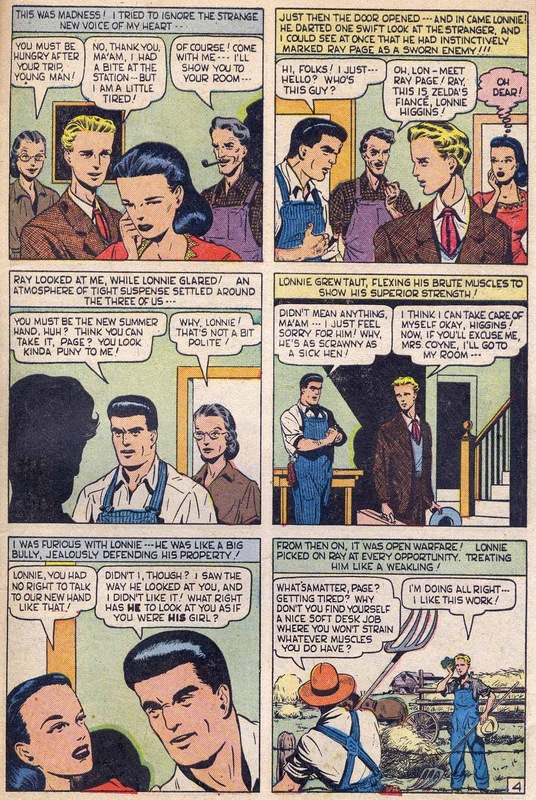 But perhaps Maneely penciled the entire splash, Everett inked it and the only remaining possible evidence of Maneely's involvement is now the single head-shot of the man on the right. 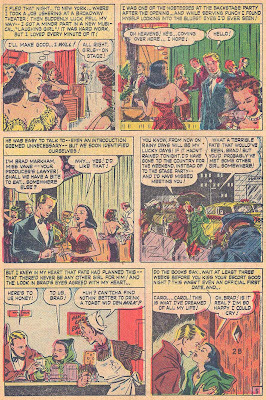 Joe Maneely drew several splash panels for other artist's stories in 1950. In fact, we can find him in one of the books already mentioned above, the classic Girl Comics #3. 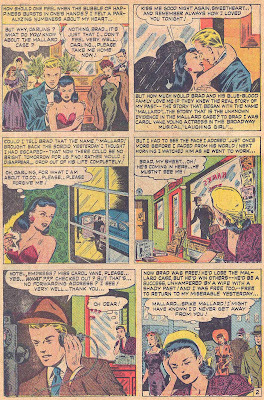 The story artist is unknown to me but it's in the style of Jack Kamen circa 1950. The splash, which I'll crop below, is Joe Maneely! 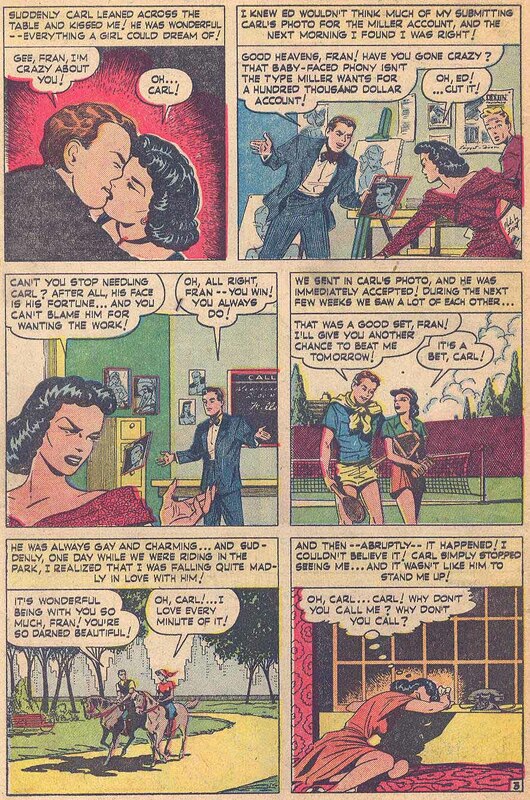 Now looking at the rest of the Everett Love Romances #15 story, the panels switch from seemingly Everett inked to pure Everett figures therein. 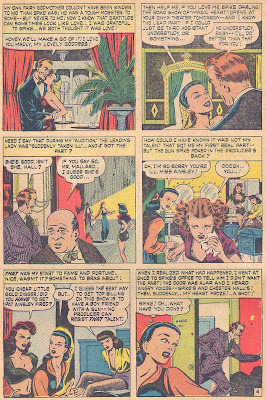 To me, the female figures below just do not look like Everett penciled them. 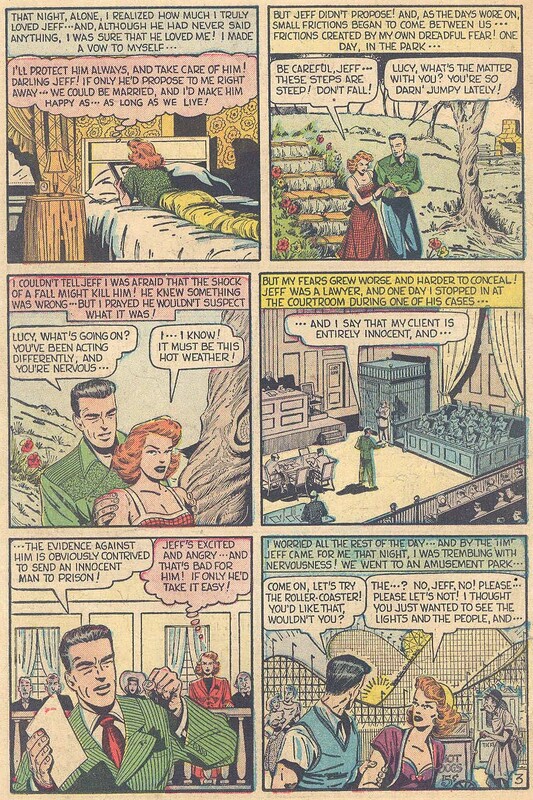 Yet look at the last panel above. Pure Bill Everett, pencils and inks. 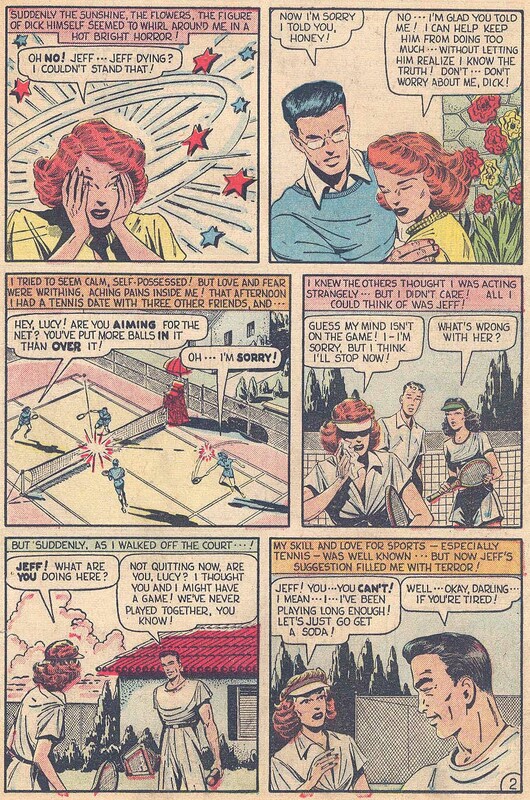 Lucy, swapping colors with her blouse, went from a red-head to a blonde, and from wearing a yellow blouse to a red one. But she can't fool us! 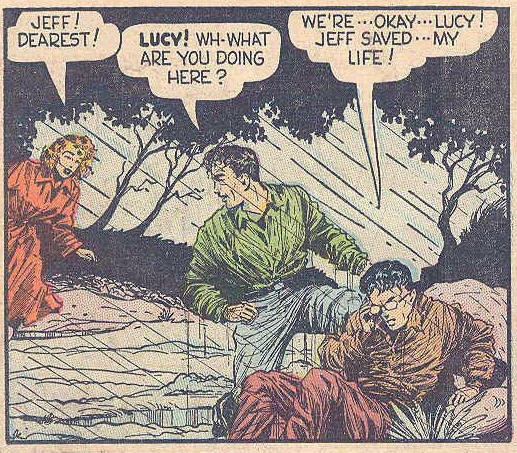 It's the same old Lucy! Thus ends the Timely period of Everett's romance work, stories drawn in late 1949, while the Timely bullpen was still extant and the staff humming away. 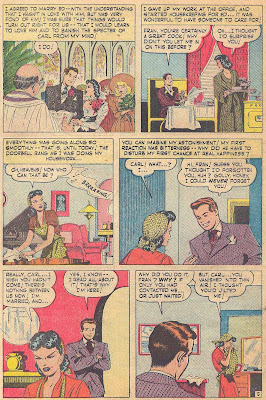 Everett was a freelancer and never worked on staff in the Empire State Building, taking his scripts from Stan Lee (or whoever was the romance line's editor at that time) drawing and/or inking them at home and delivering completed work in person. 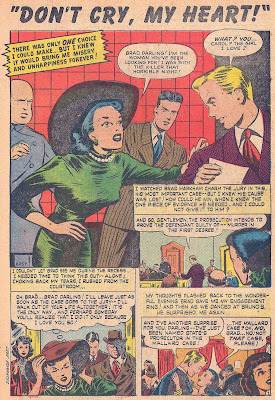 Two stories also appeared in early 1951 with mysterious 1949 era job numbers. 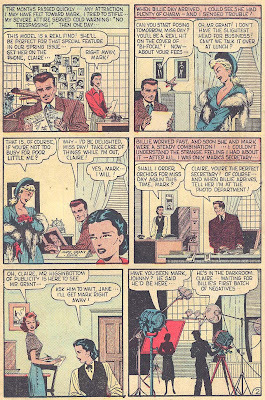 After the last of the staff was let go in January 1950, Timely house styles and boringly familiar panel grids would vanish as more expressive and personal freelance work replaced the assembly-line piecemeal story art. Signatures, rarely seen since the immediate post-war period, will begin to make a return as freelance artists felt more pride in identifying their work, usually done as full art, which improves tremendously. Next up we we segue into the Atlas period. Vassallo, Michael J.. Every scan and iota of Timely-Atlas data above. Dixons in comics, would include Jim Dixon, who assisted Will Eisner on the Spirit in 1950-1951. I saw that Steve. The date somewhat matches but I can't believe it's him. There's no evidence he would ever have been on staff at Timely where the pencils would have likely originated. Phil, Tom Dixon is a pseudonym for artist Arthur Pinajian. Pinajian's Bails credit as a western artist at Marvel from 1950 to 1959 is patently incorrect an an obvious misprint of some sort. 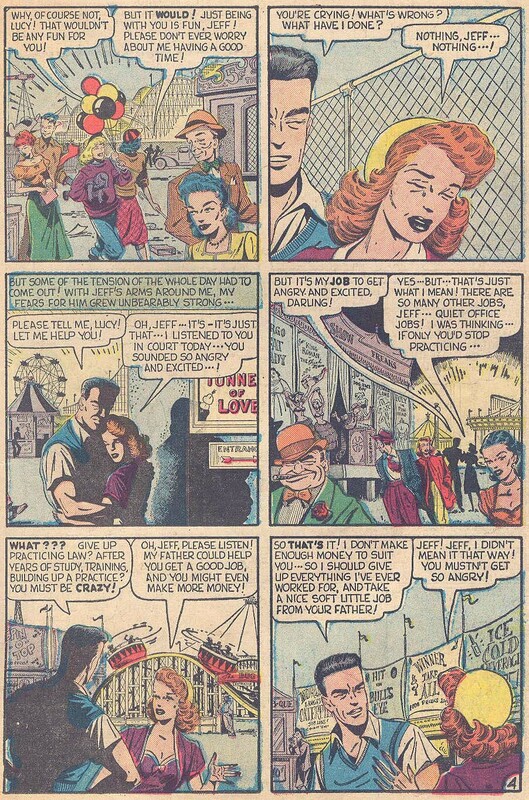 His only Timely/Atlas/Marvel credit I know is Marvel Comics #1's Jungle terror. I'm slowly savoring this post, so I'll comment as I move along. 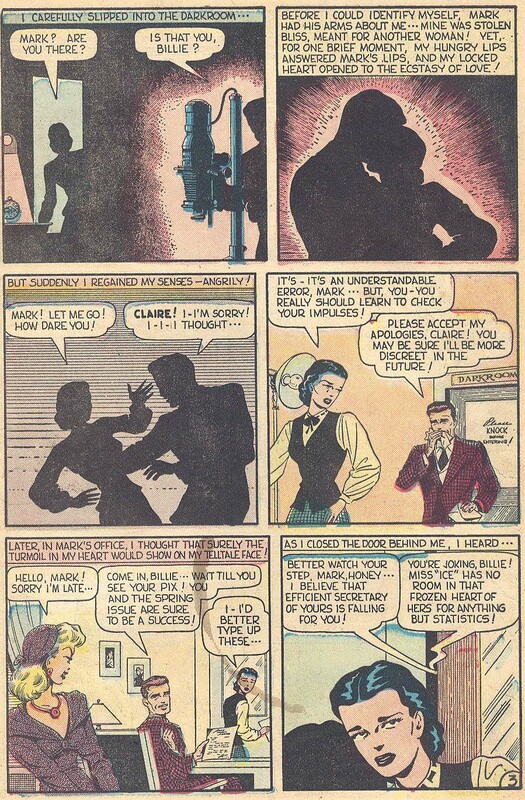 On the first two stories my "instincts" tell me that these are pencilled by Everett, with perhaps another hand in a few panels on the second story. 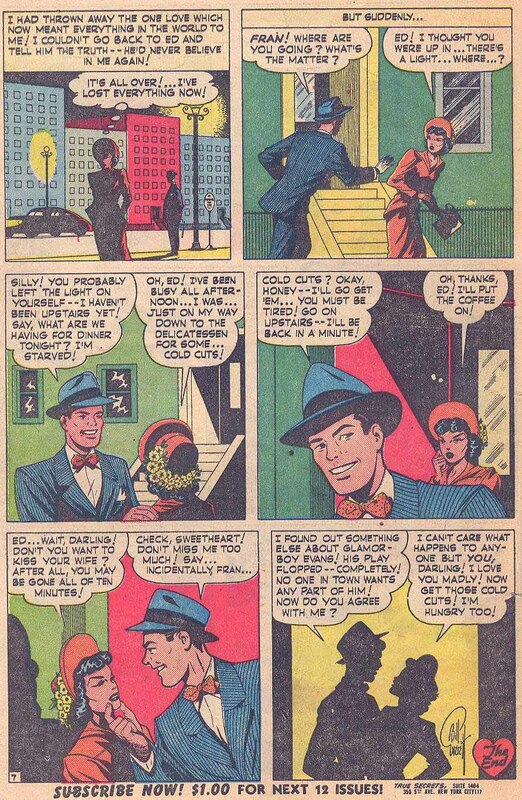 I also believe Everett lettered the second story. 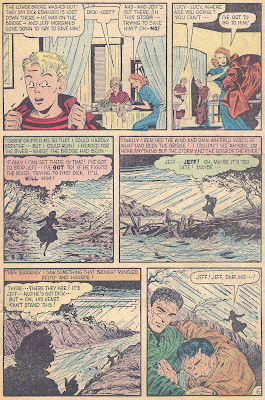 Everett's art is a joy to see, particularly the first story, with those final rain soaked pages. Thanks for sharing this neglected area of Everett's work. Wow, excellent article! Thanks for all your hard work. 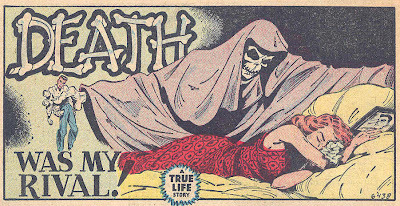 "Once in a Lifetime" - I disagree with you on the lettering. 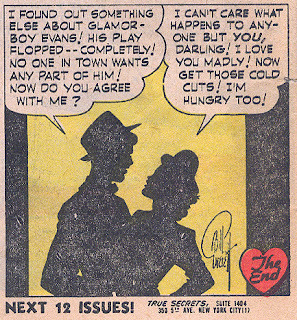 This looks like Everett's distinctive, stylized lettering to me. I do think another hand may be involved in the pencils, likely Sitton. The face (and the hair) of the dark haired guy look odd to me; something distinctly non-Everett. 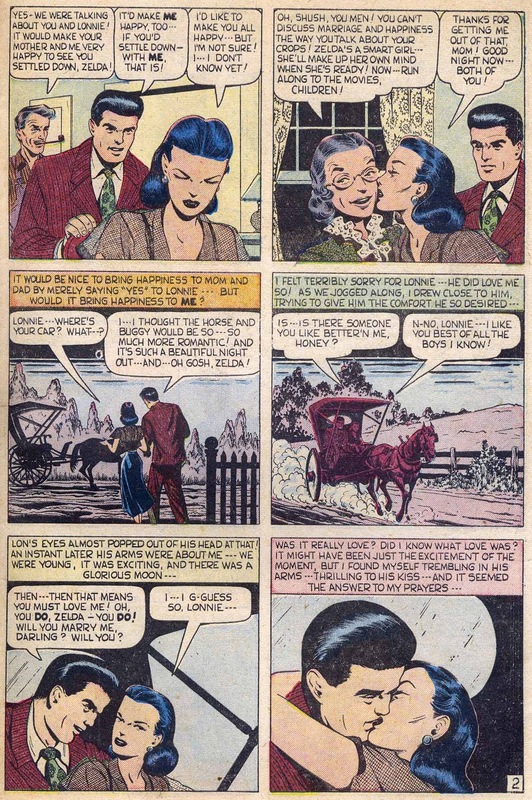 Still, there are some panels that appear to have more Everett input; the second panel on the last page has a perspective that reminds me of solo Everett. Perhaps he redrew a few panels? 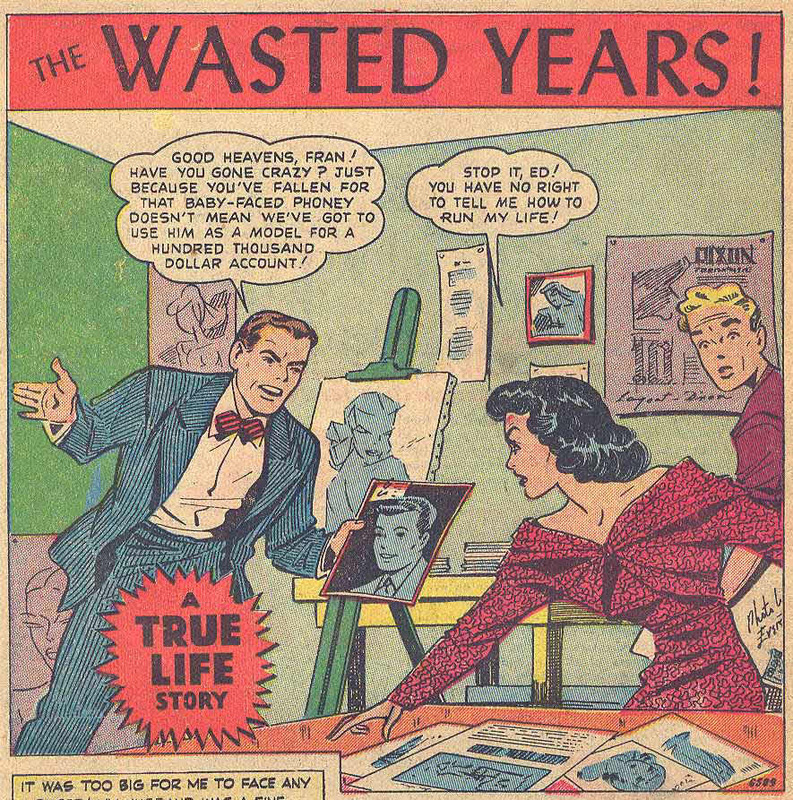 "The Wasted Years" has me even more convinced that a penciler lurks beneath. 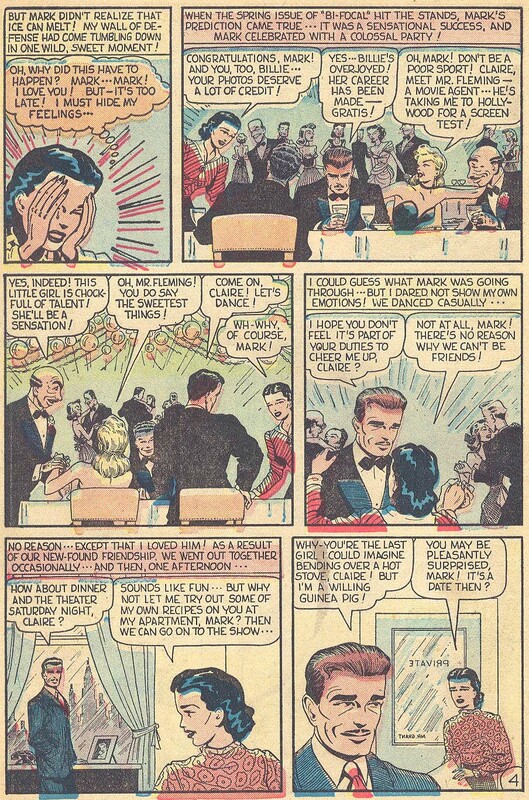 The layouts and figures don't look as confident or detailed, and the men's faces look different. Compare the "clnch" here with other Everett clinches. 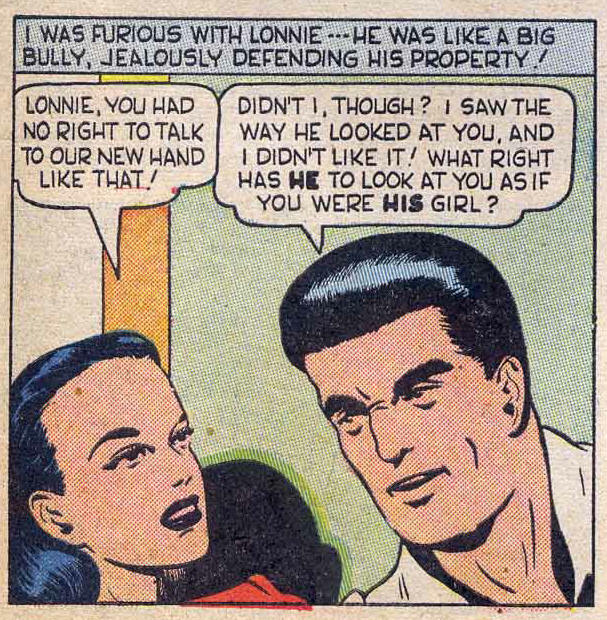 As far as his signature goes, perhaps he reworked the pencils enough for him to feel it was waranted. Finally, "Don't Cry, my Heart!". I'm less convinced than you that this is not "pure" Everett, but its certainly possible. Wow! 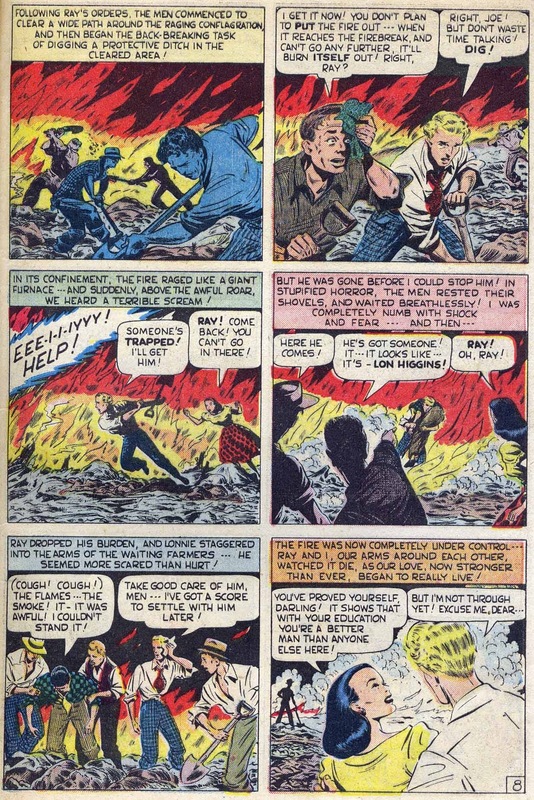 Pencils OR inks, Everett was a distinctive and imaginative artist, and would remain so for decades. Thanks for another educational post! 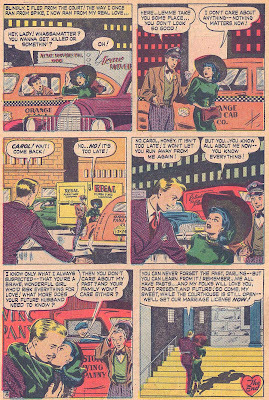 Looking at it again, I think you are correct on Everett's lettering the Sitton(? 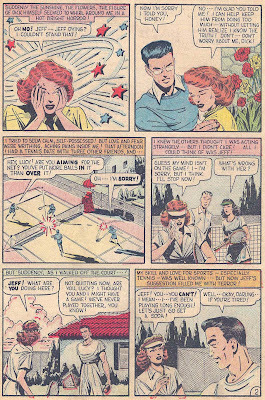 )/Everett story in Girl's Comics #3. In fact, it's obvious, now that I look at it! On "Don't Cry, My Heart! ", your opinion is important as it's awfully difficult to see "below" Everett and then decide if it's either not him or if it's just him being simplistic. Impressive! Are you going to cover the Love Diary stories as well? Probably not as they are not Timely-Atlas, Ger. I mentioned them for contrast. 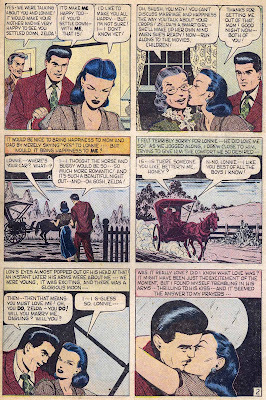 In retrospect, I should have put up the Everett inked splashes by Nina Albright and Al Camy, in addition to the solo Everett, but I didn't want to get too far off topic. Maybe in an edit to this post in the future. Thanks for the comments! It was a great era, wasn't it? Speaking of Pinajian -- a bungalow on Long Island was just discovered filled with his art and valued at $30 million! The family sold the art for $2000.